We completed this home in the Olivette Community near Asheville for a growing family in September 2018. 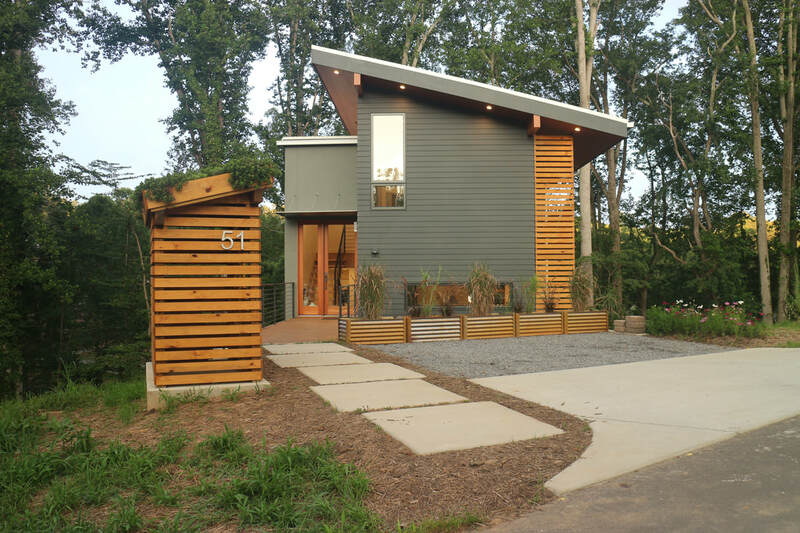 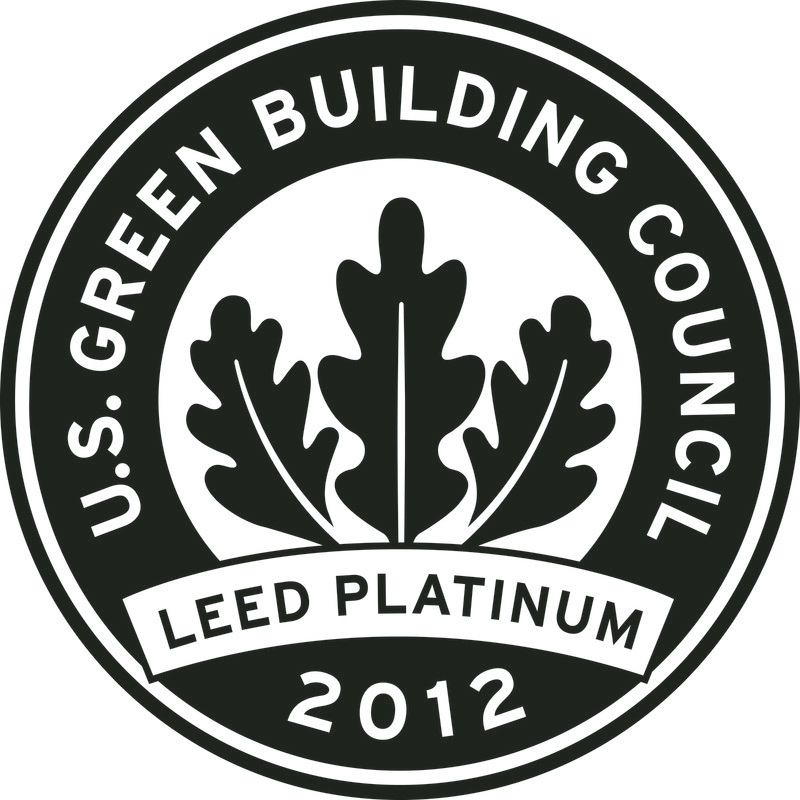 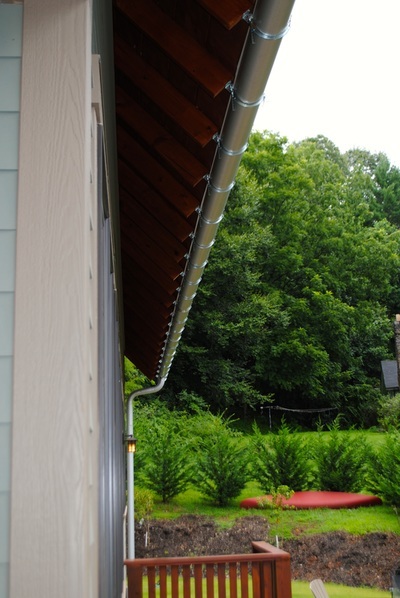 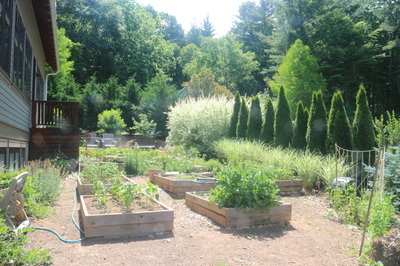 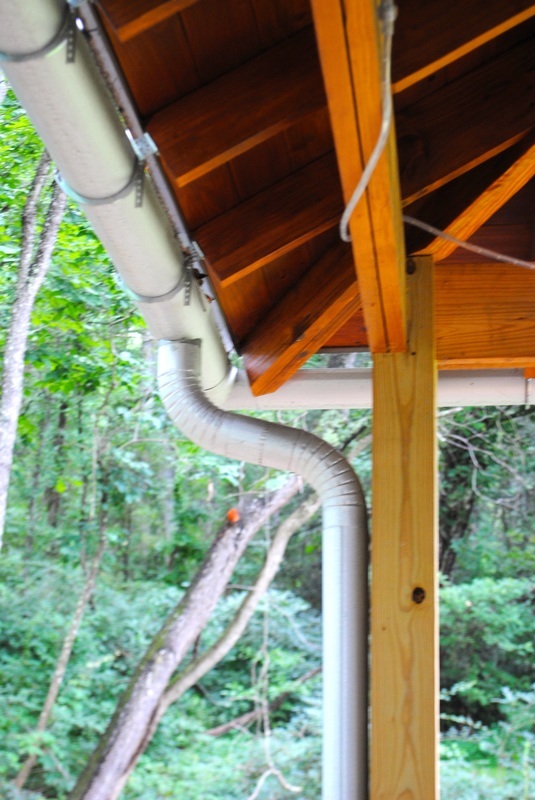 It will soon be Net-Zero and NC GreenBuilt Platinum certified. 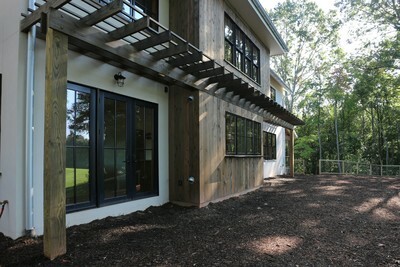 Landscaping and more pictures coming soon. The first of nine homes to be built in Shelburne Woods, this home was completed in June of 2017. It was a collaboration with our friends at Rusafova-Markulis architects and is Net-Zero and NC GreenBuilt Platinum certified. 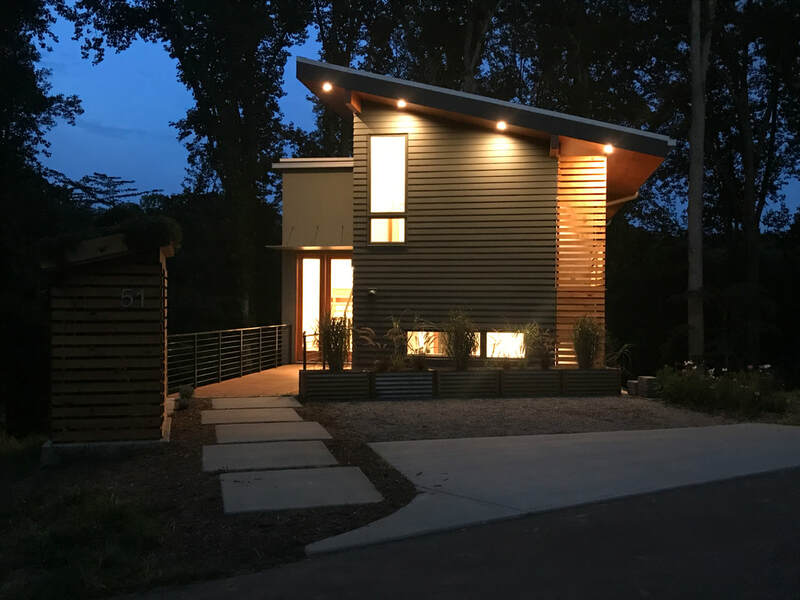 The home won both the Gold Craftsmanship and Green Home Awards in the 2017 AHBA Parade of Homes and was featured in the Fine Homebuilding 2018 Houses issue Reader's Choice Contest. 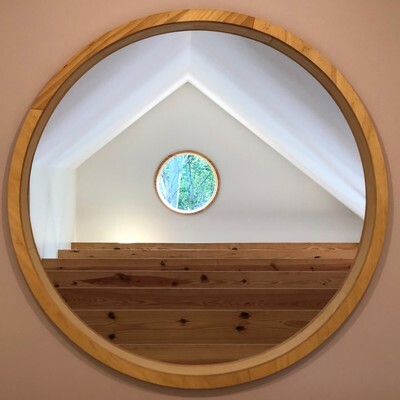 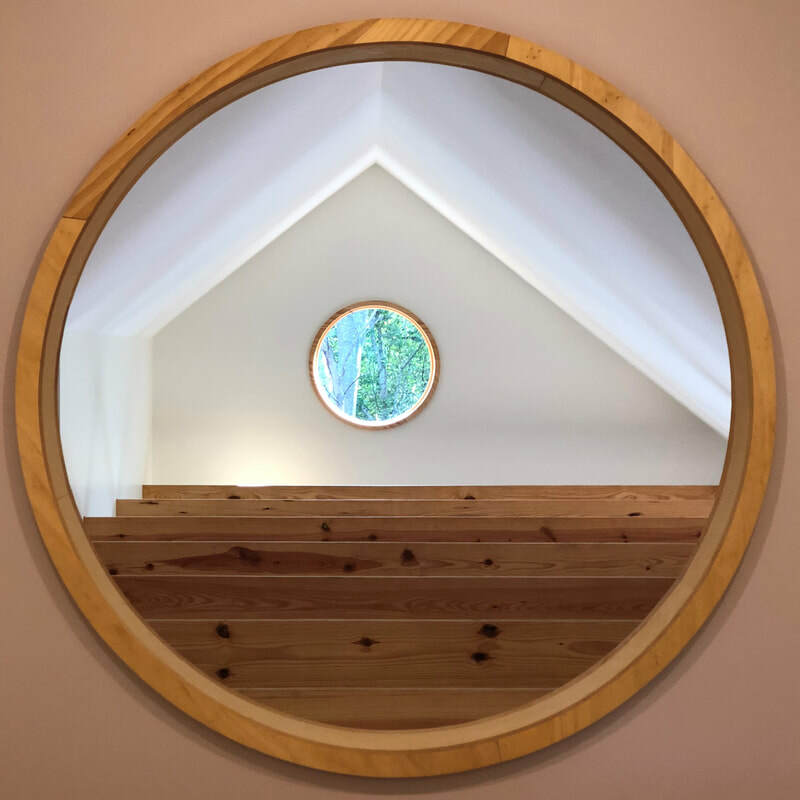 We don't do many renovations, but the opportunity to update the home that architect Bill Moore designed and built to be his personal residence was something we didn't want to pass up. 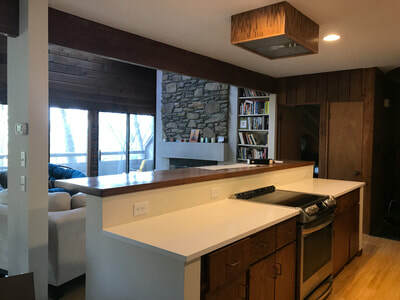 The homeowners wanted to open the galley kitchen on the North side of the house to the living and dining areas and the long range views from the home's perch on Sunset Mountain. 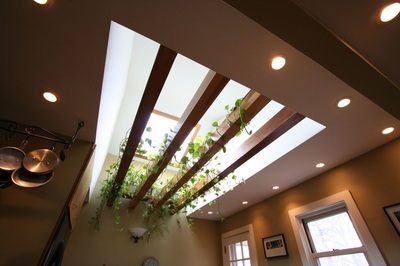 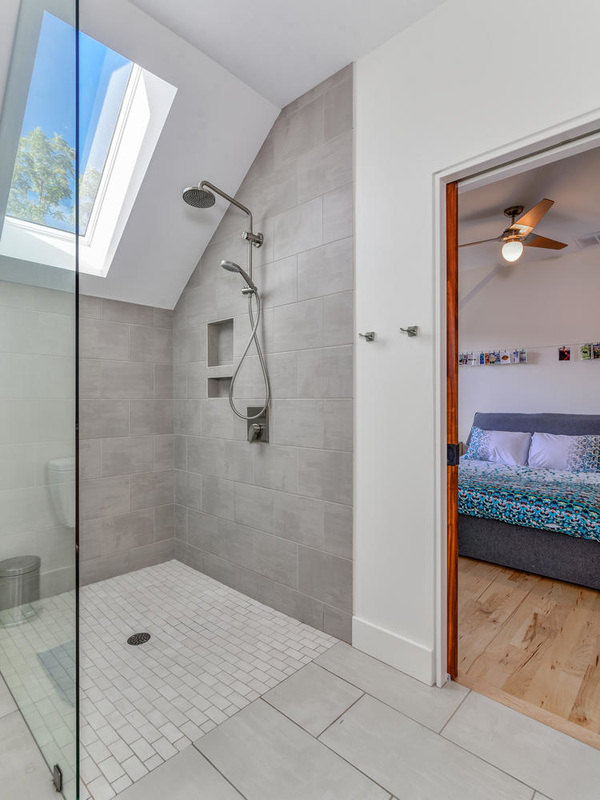 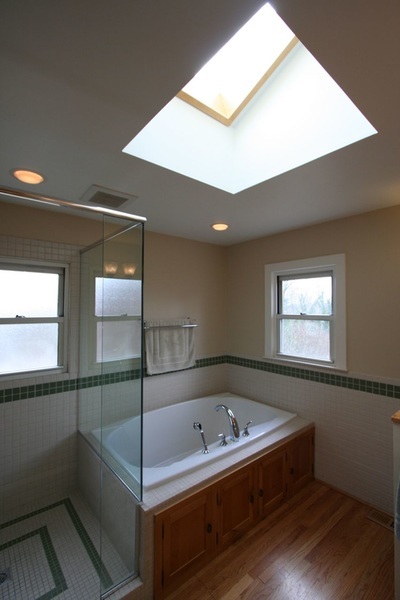 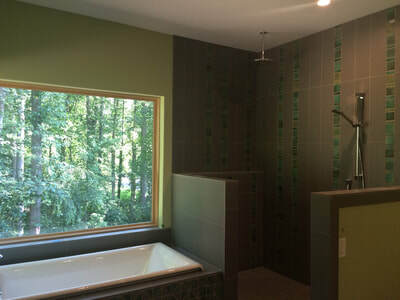 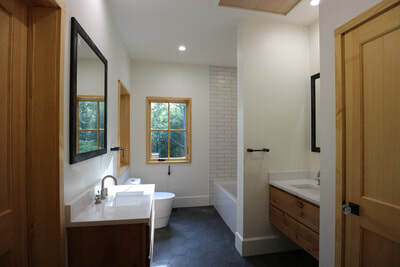 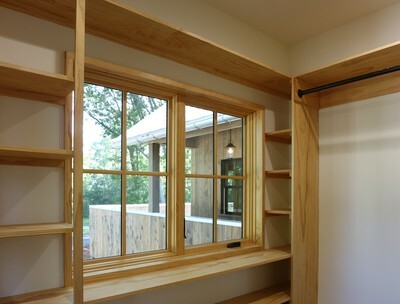 They also wanted to raise the lowered ceilings in the bathrooms and add windows to brighten the spaces. 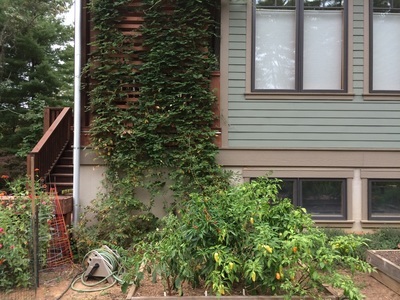 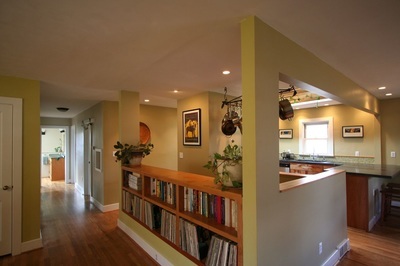 It was very important to the current homeowners (and to us) that we retain the original character of the house. 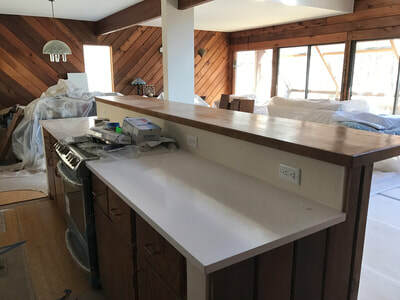 We tried to make it look as though we had not done anything to the house. Below rendering is Bill Moore's own rendering of the exterior along with a photo of the exterior from relatively recently. 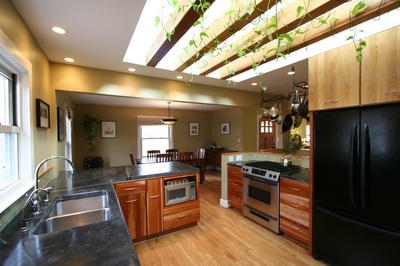 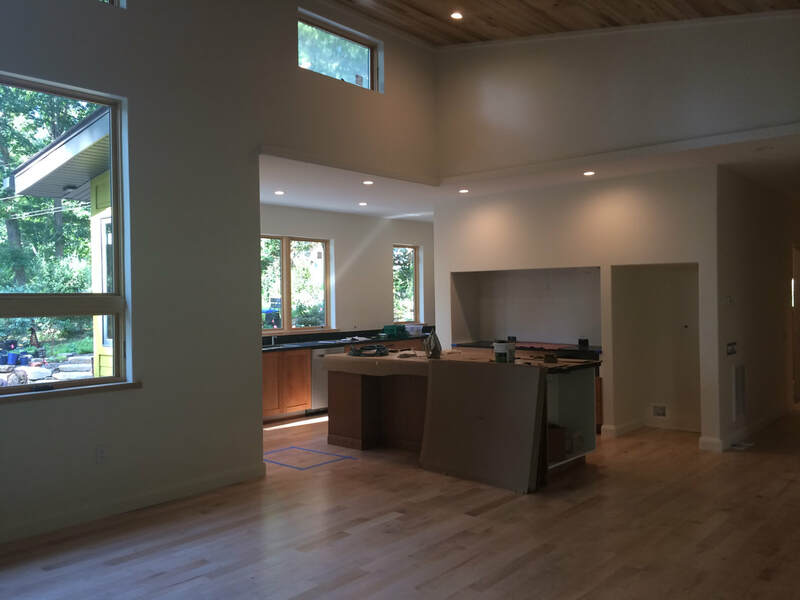 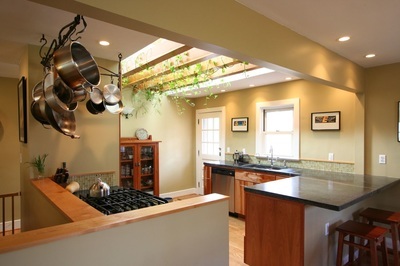 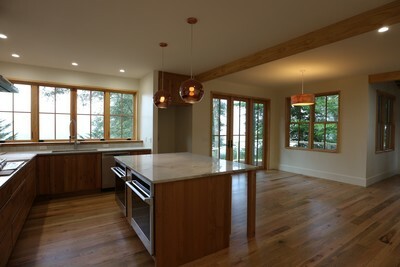 The interior picture shows the walls dividing the main living space and kitchen. 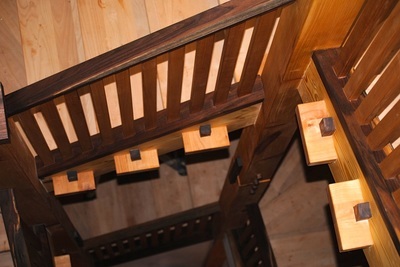 The last three pictures are of the project close to completion. 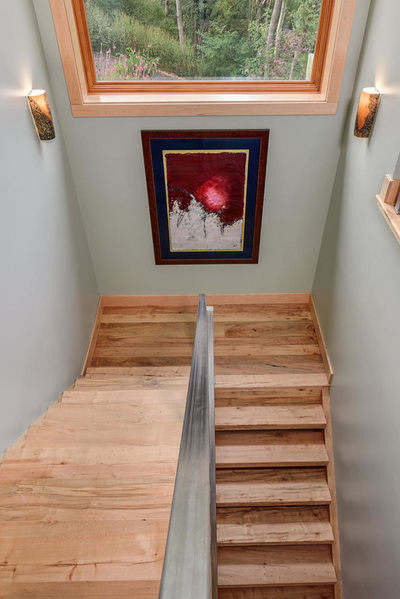 We were brought on after framing was complete to finish this house custom designed by Aaron Wilson for a couple of amazing artists and gardeners to be their forever home. 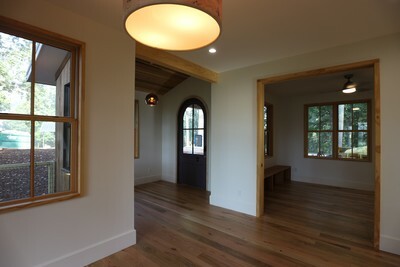 We enjoyed collaborating on this project with other creative folks. 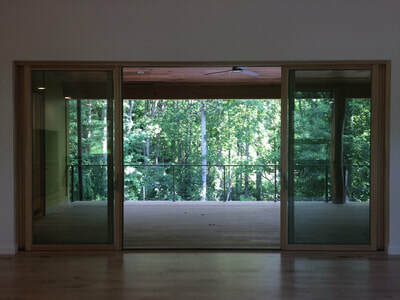 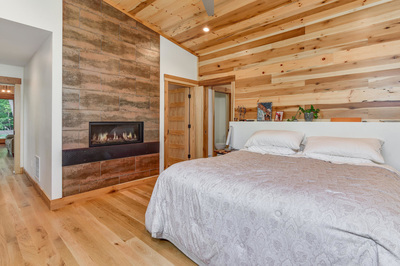 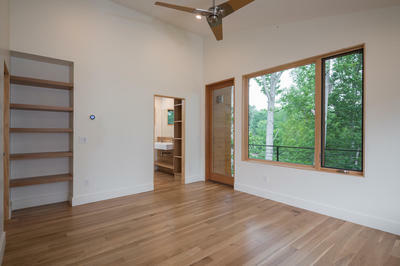 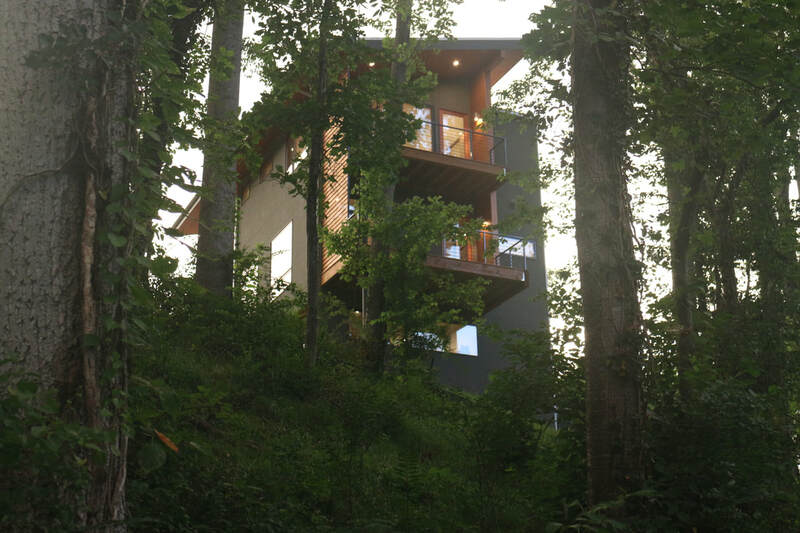 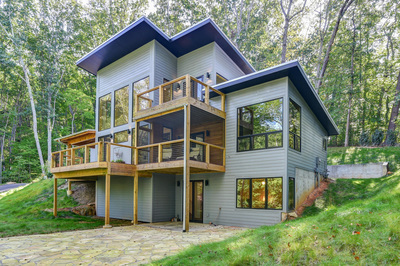 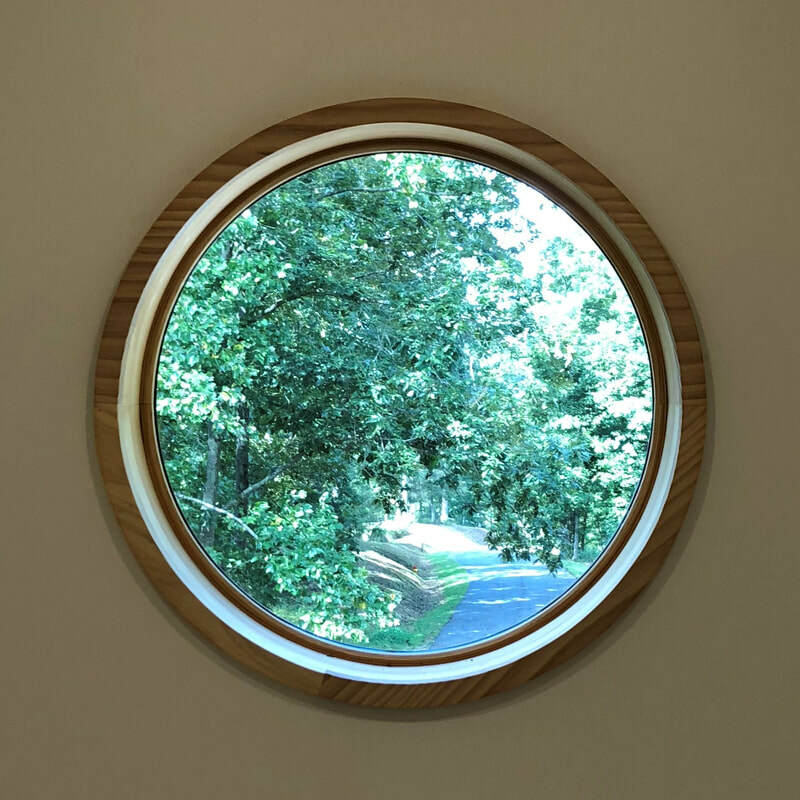 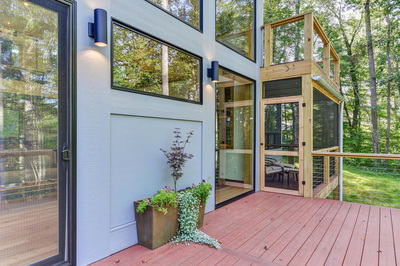 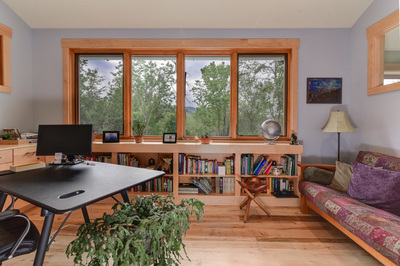 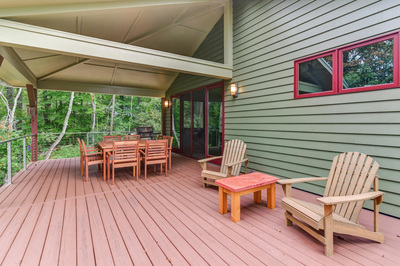 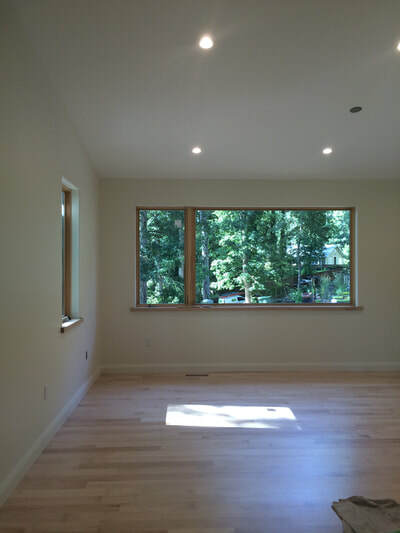 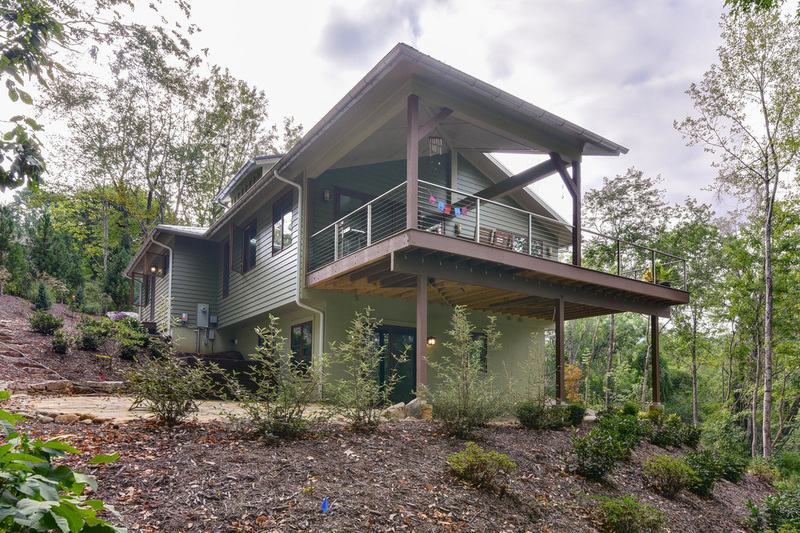 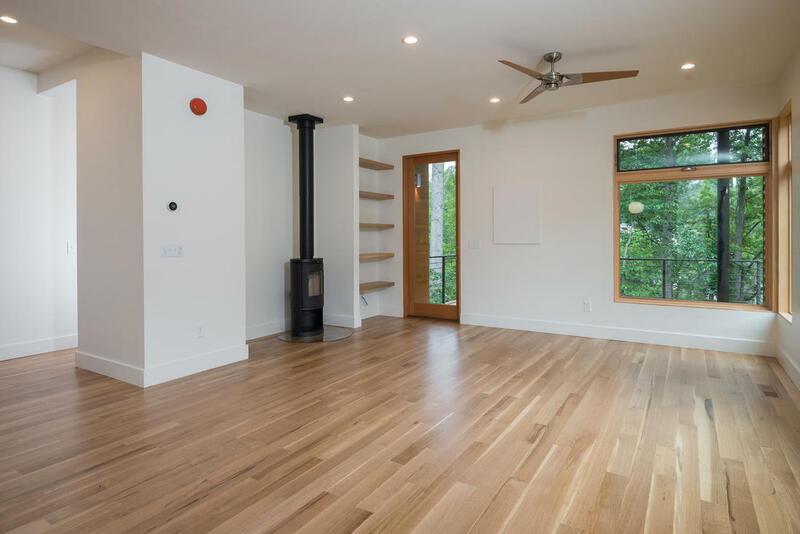 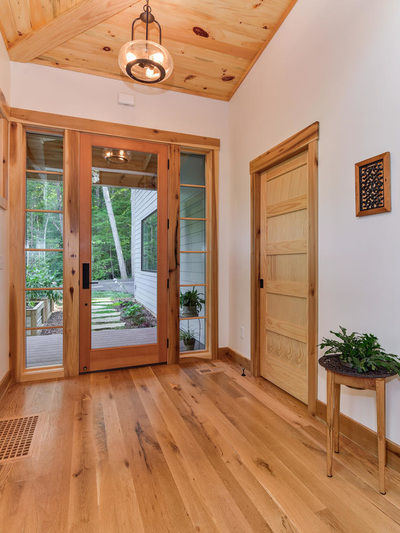 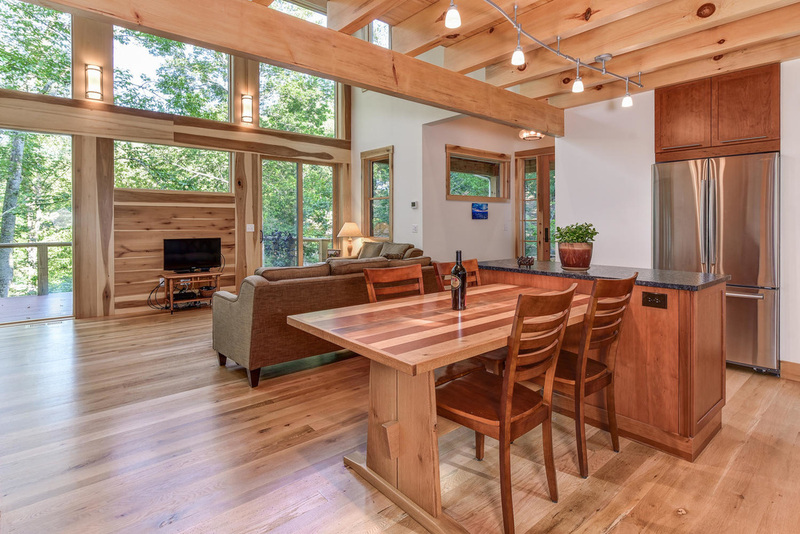 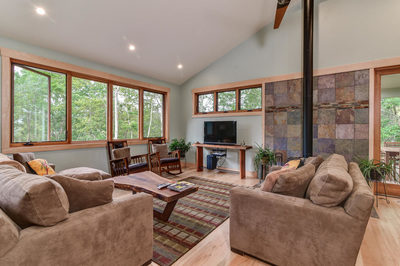 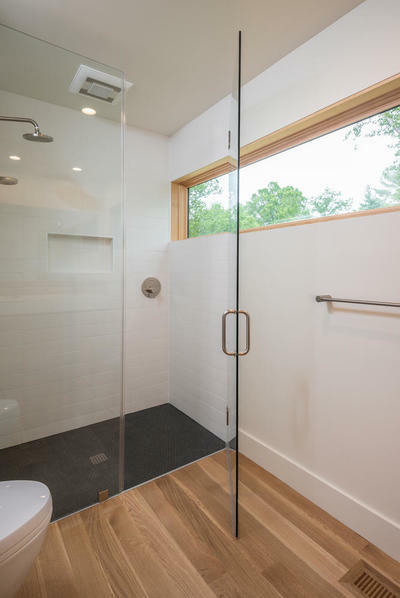 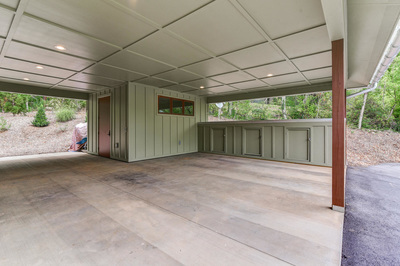 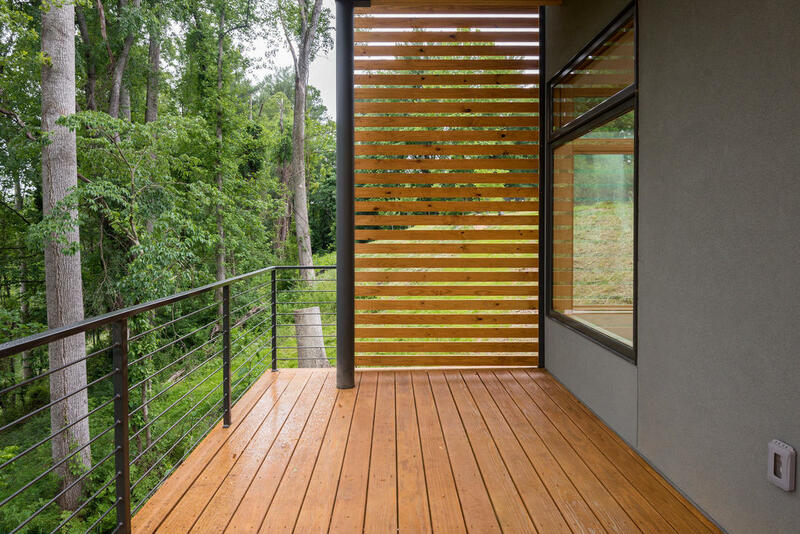 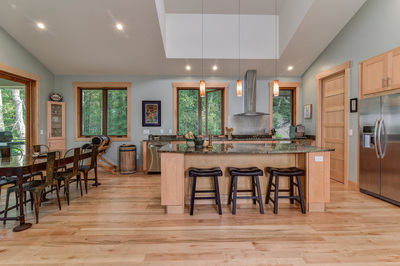 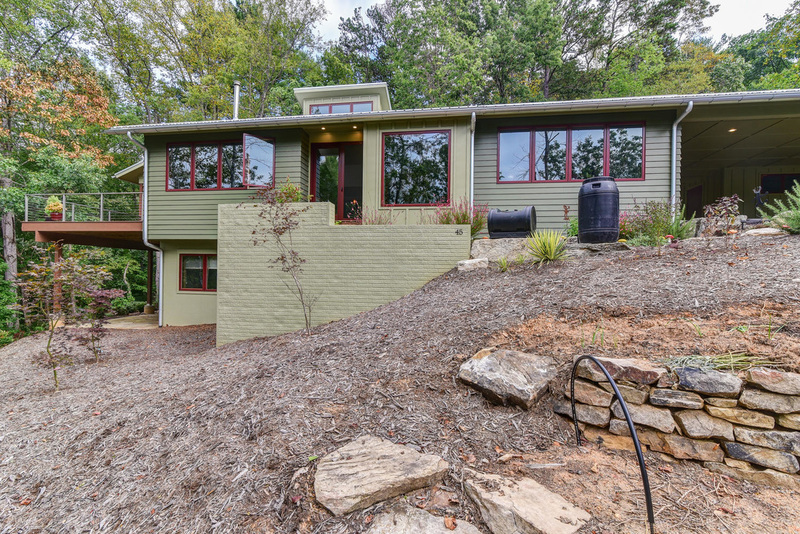 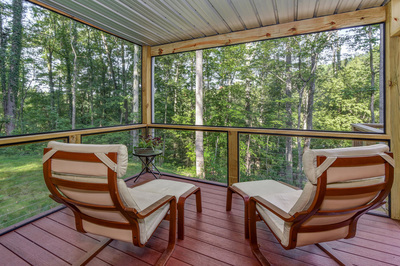 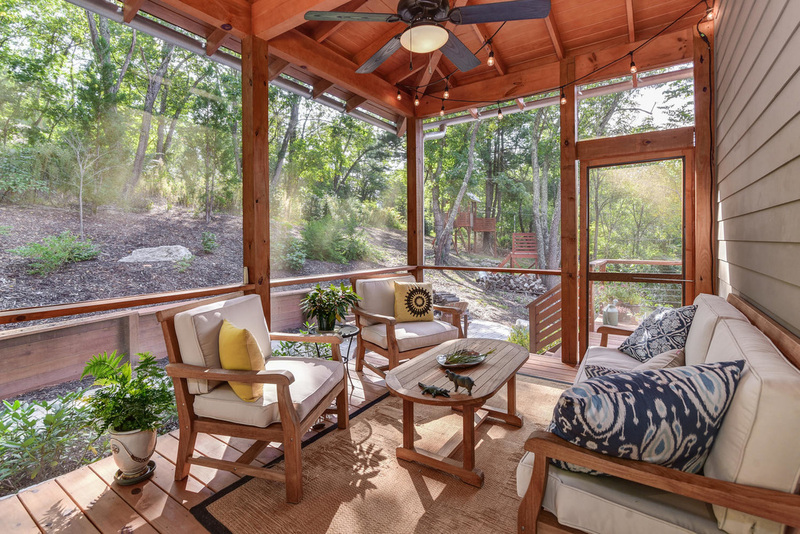 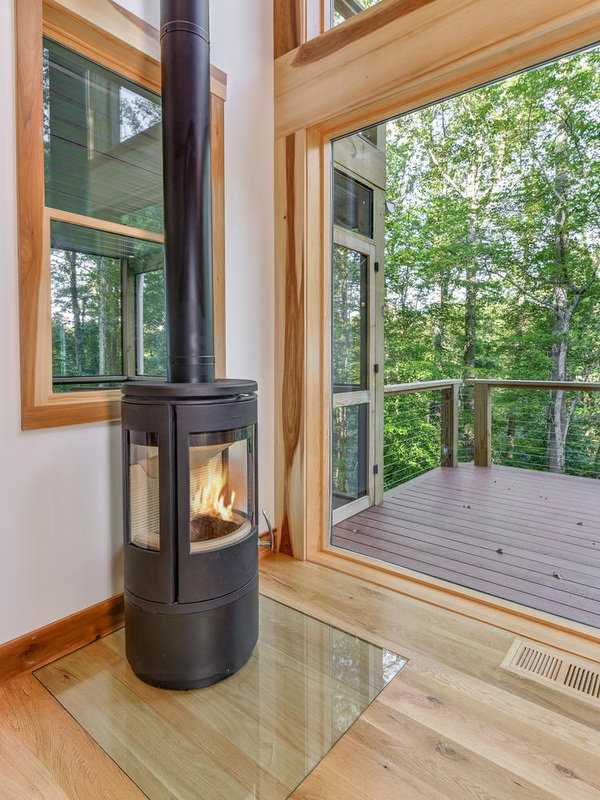 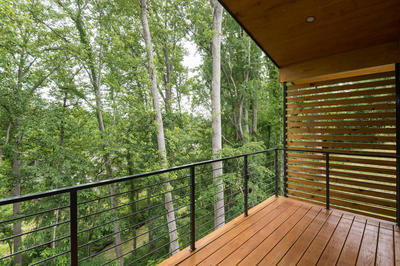 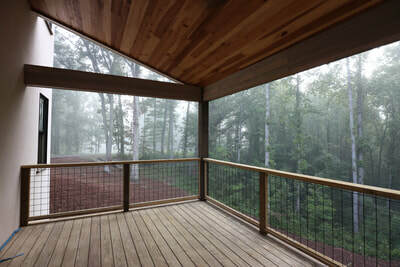 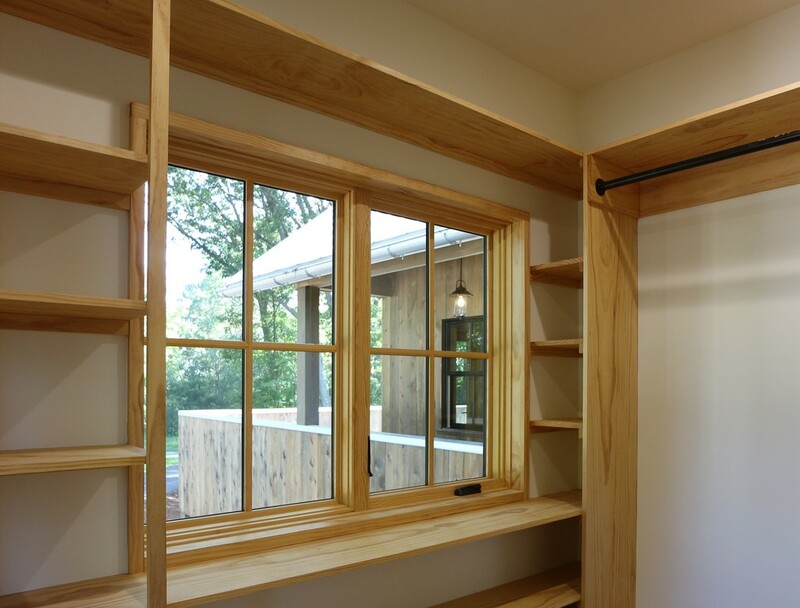 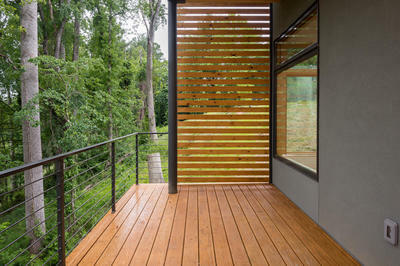 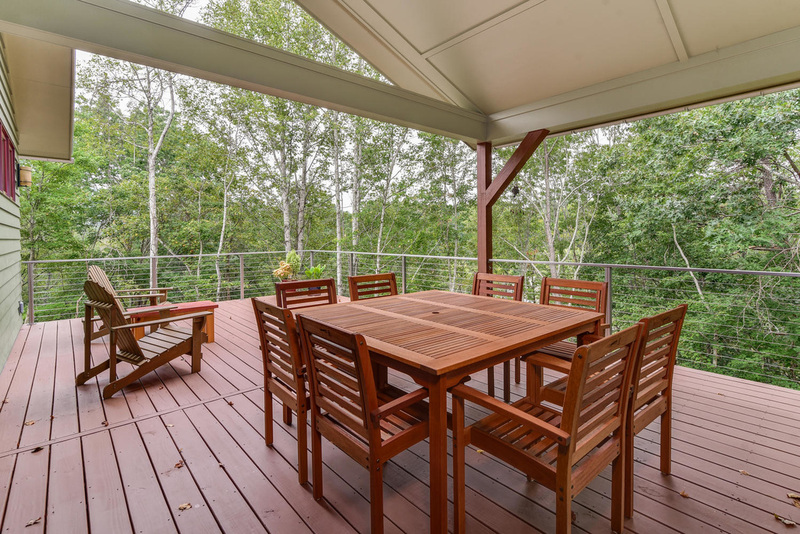 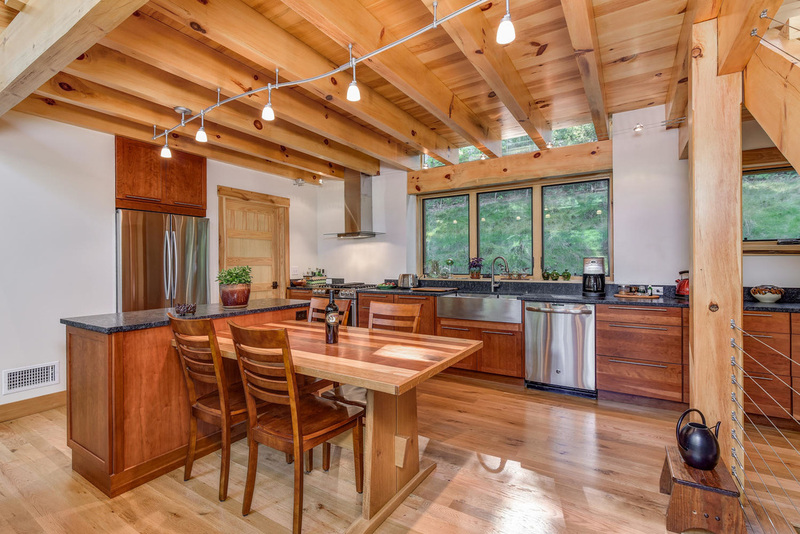 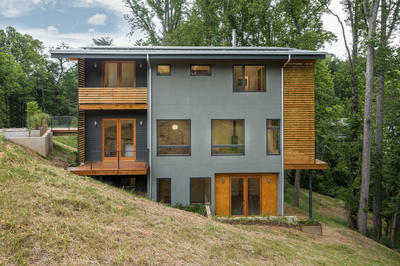 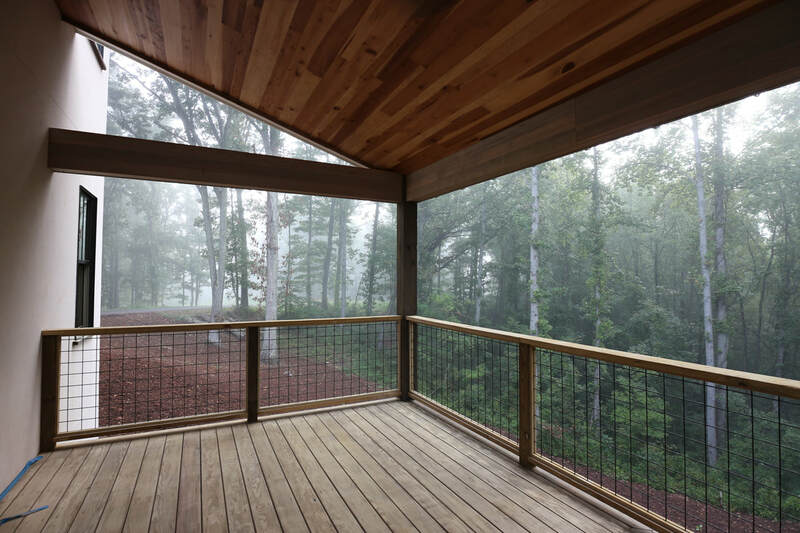 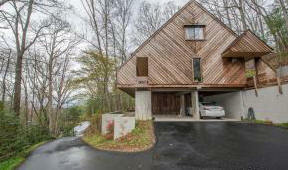 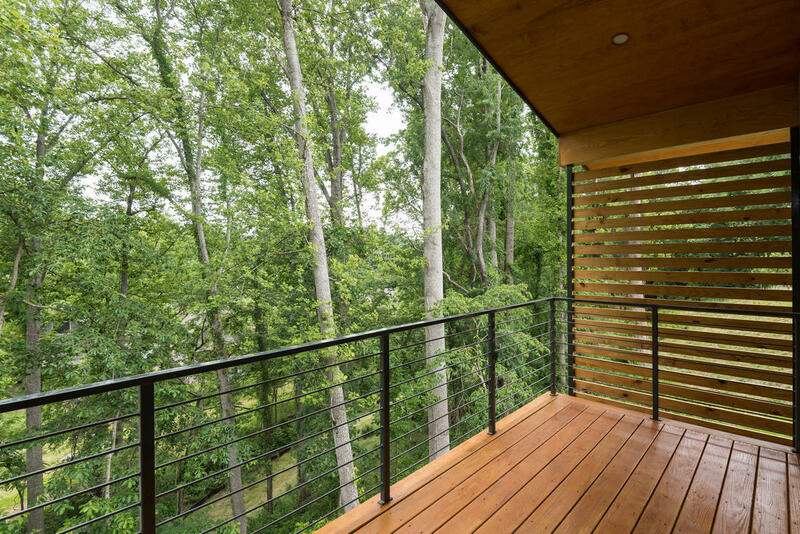 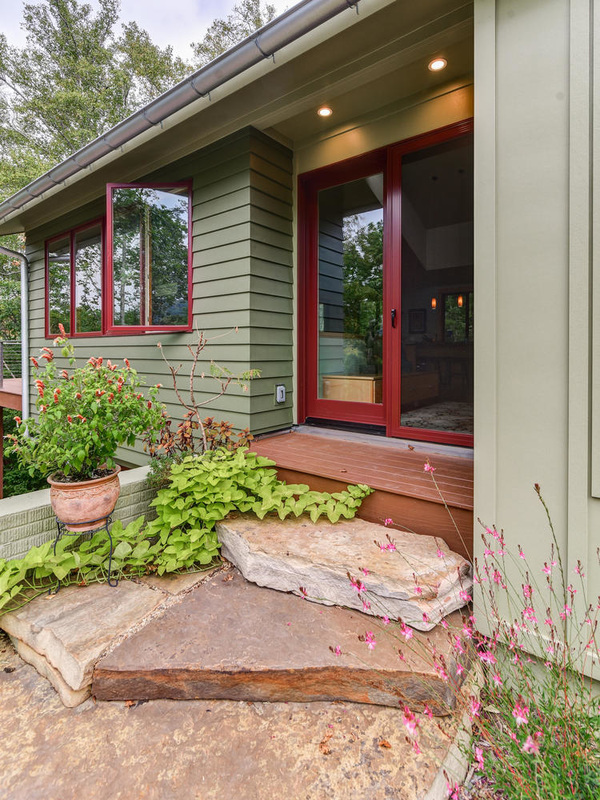 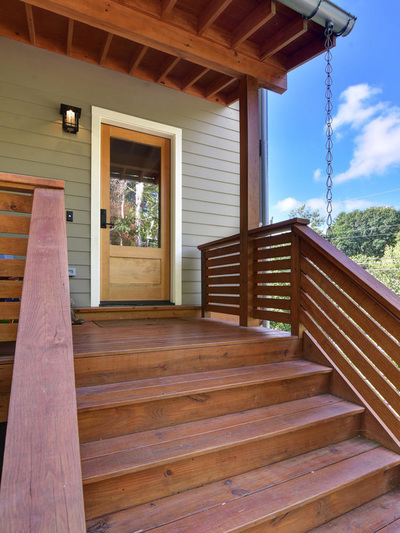 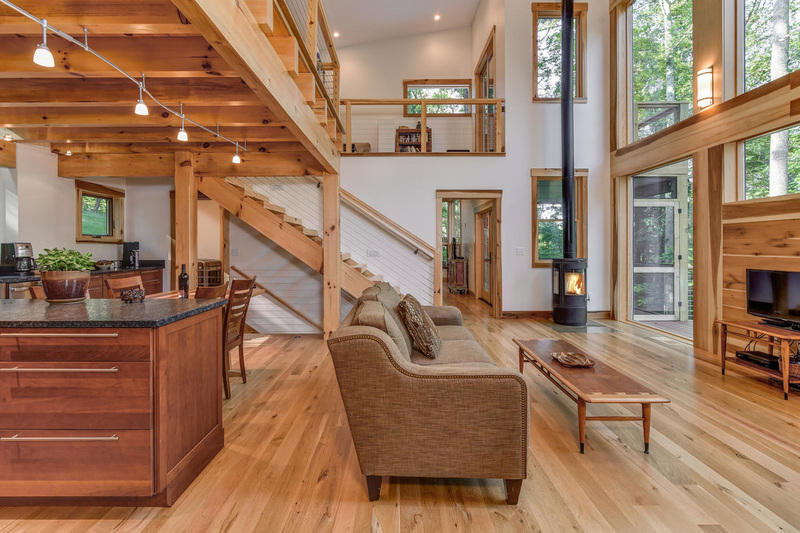 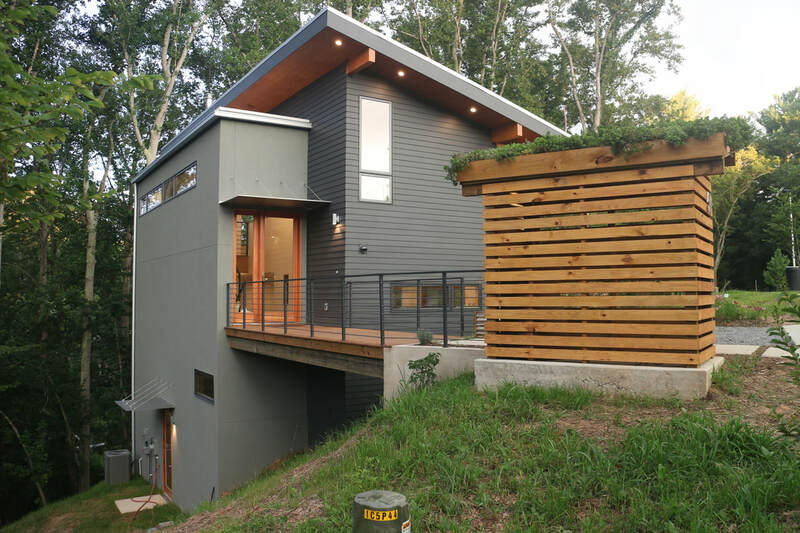 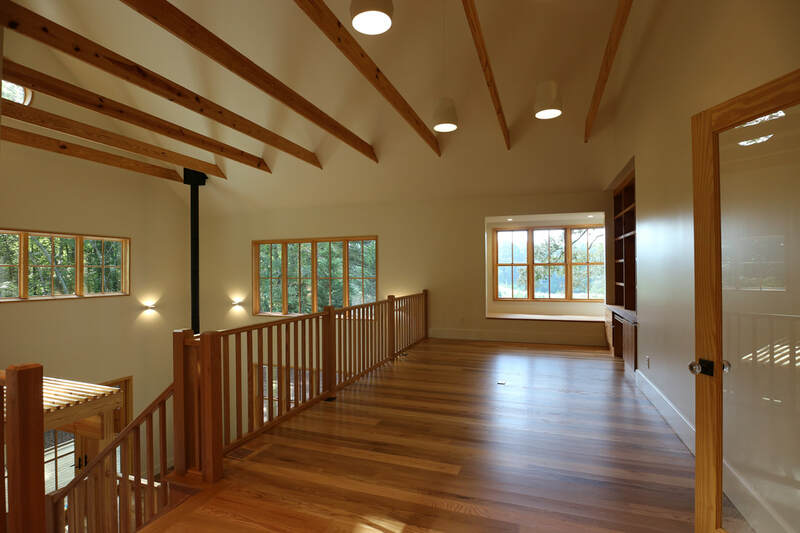 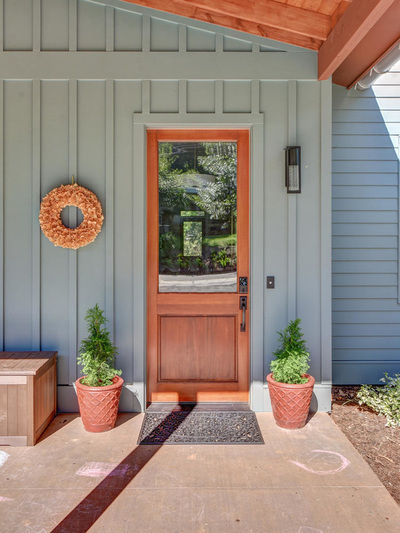 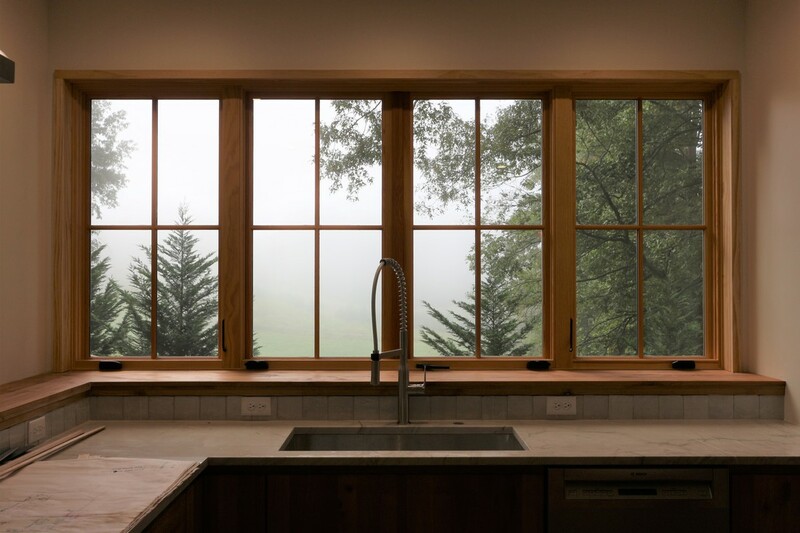 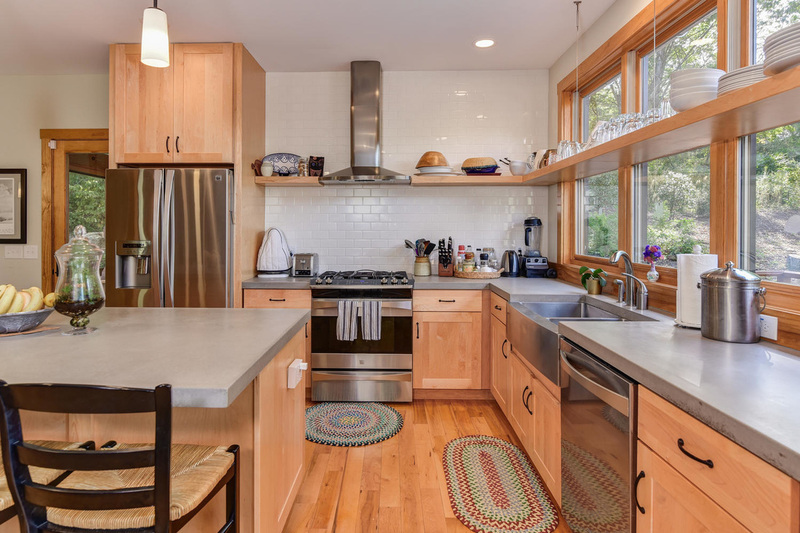 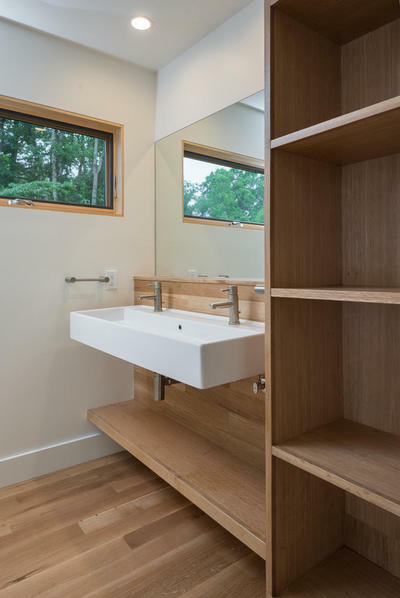 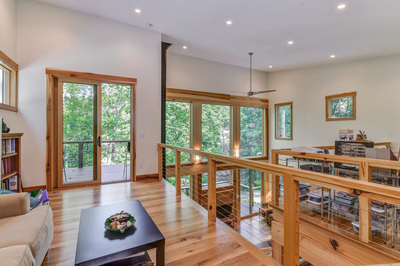 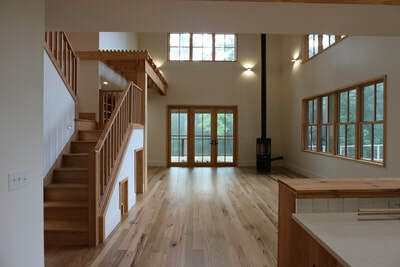 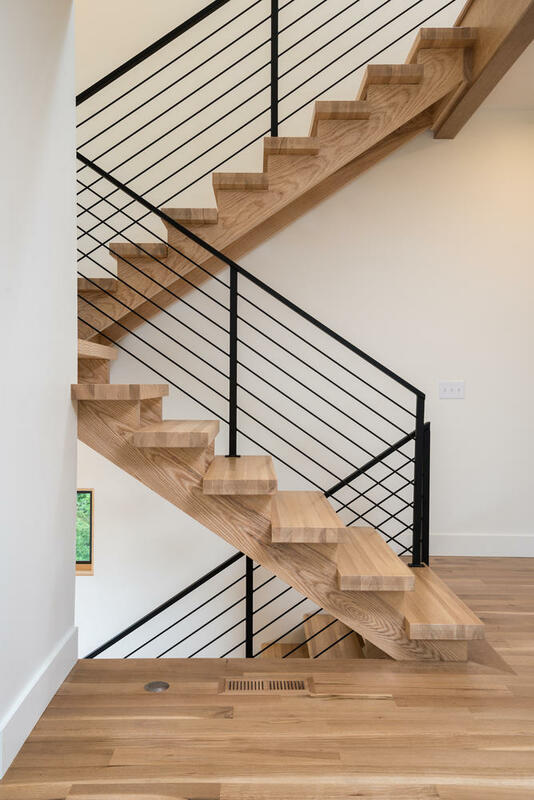 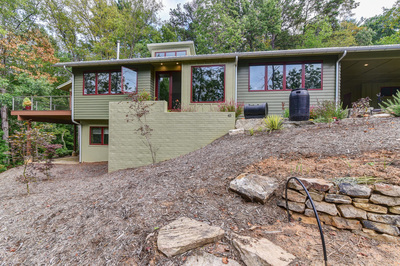 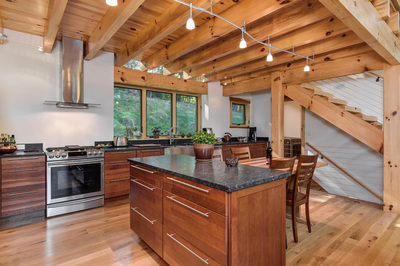 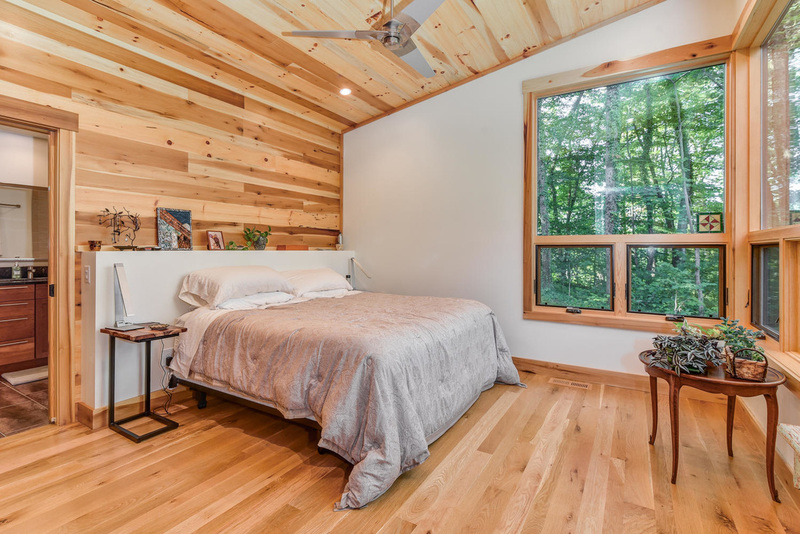 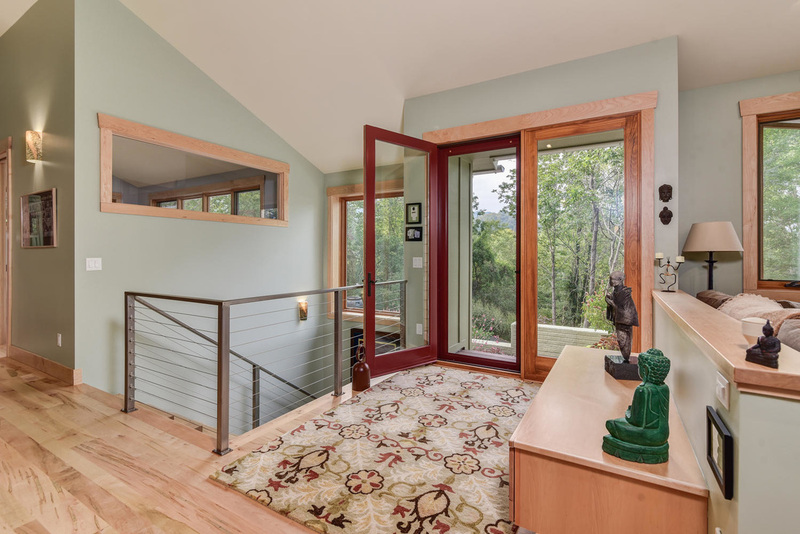 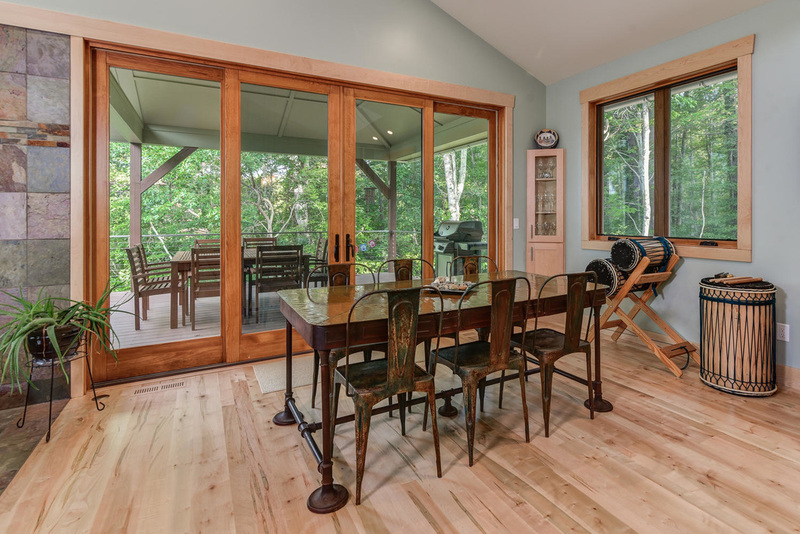 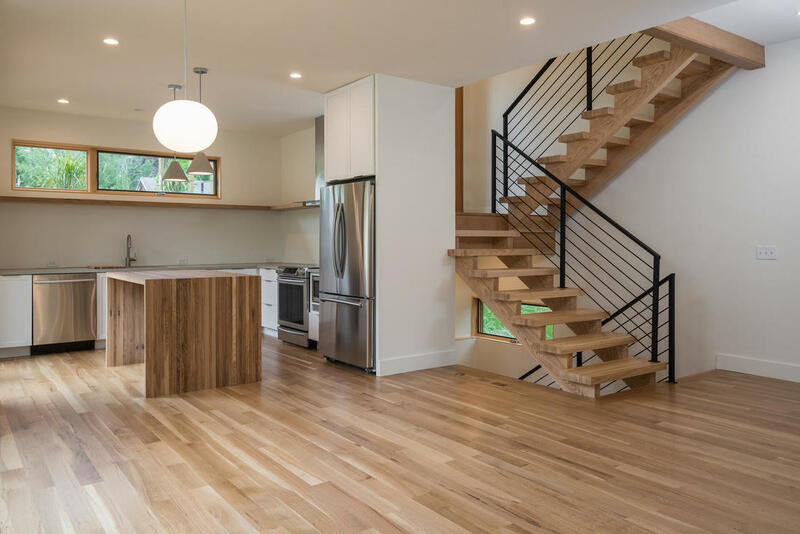 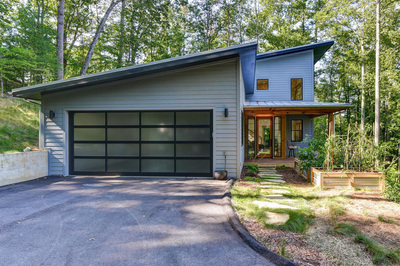 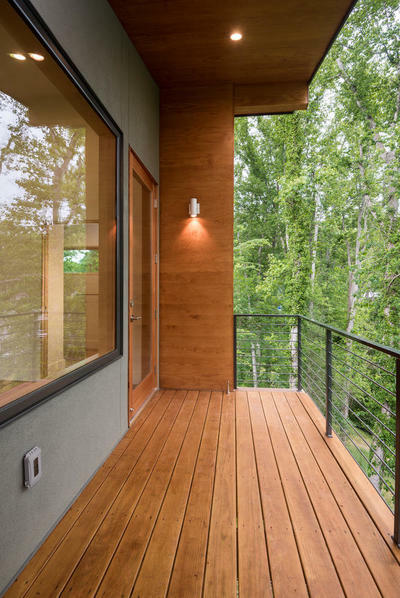 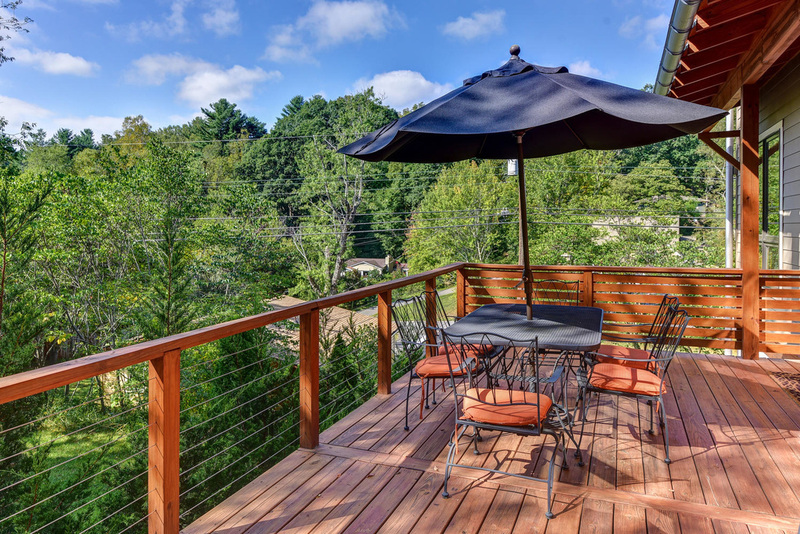 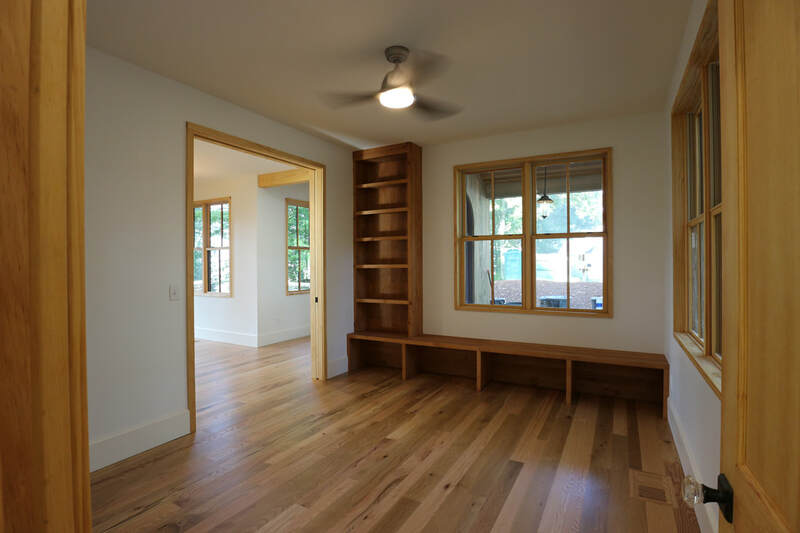 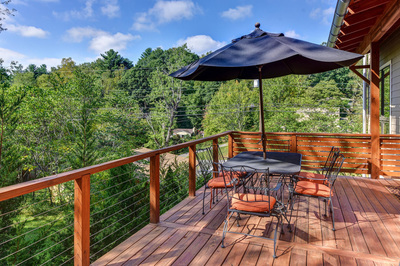 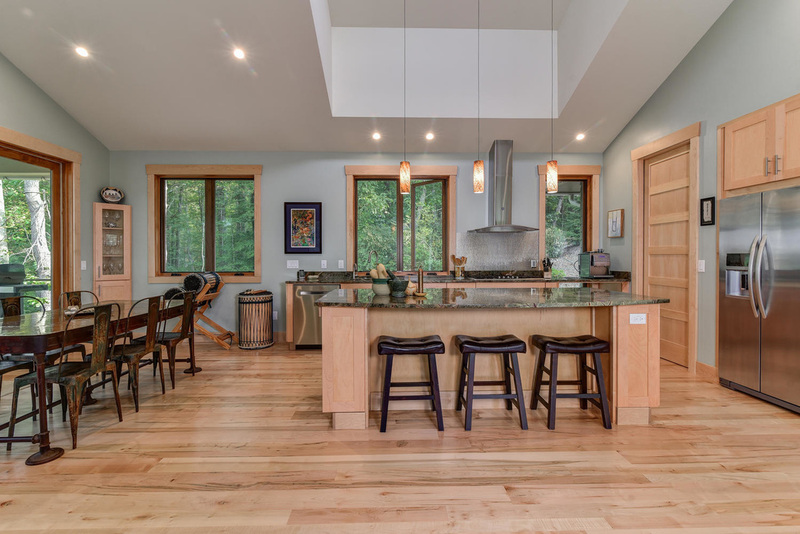 Completed in April 2016, this custom contemporary home in a private North Asheville setting makes extensive use of site milled lumber and has a wall of windows and several porches and decks to take advantage of the peaceful setting in the treetops. An open living area and art and office loft give the space a light and airy feeling. Click on the images below for larger pictures. 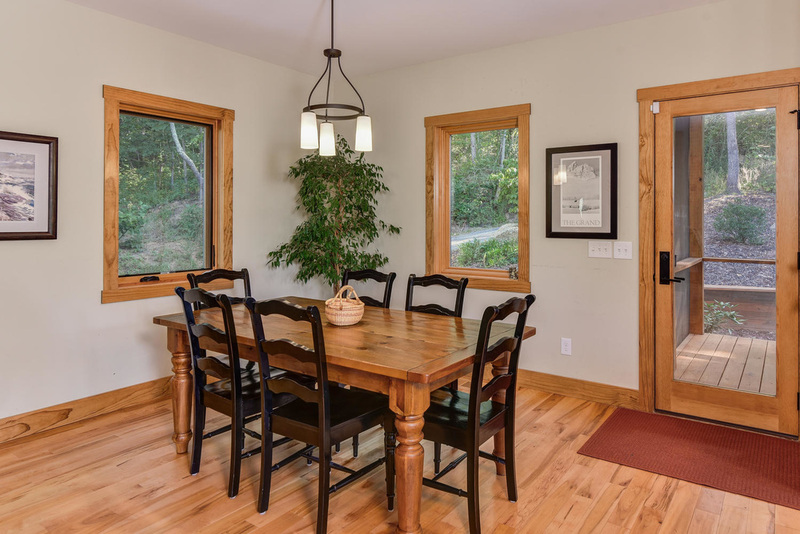 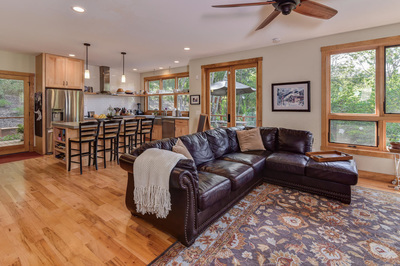 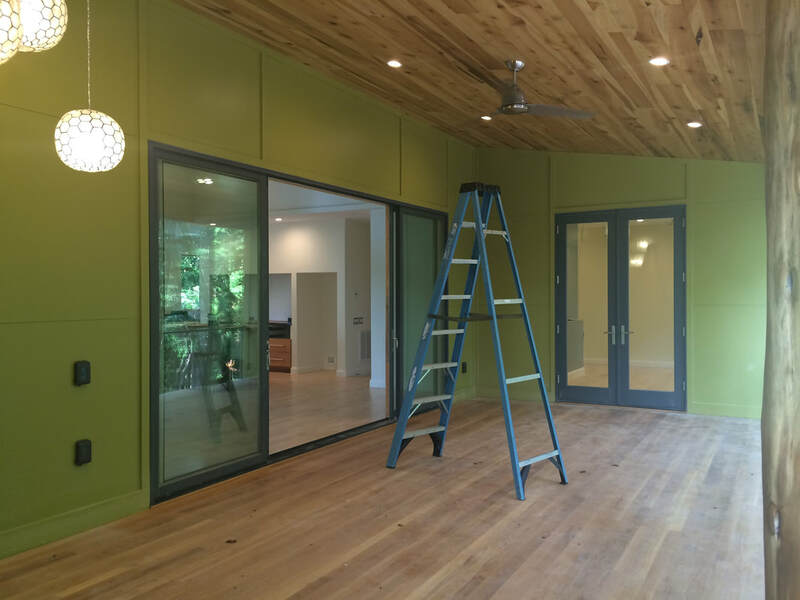 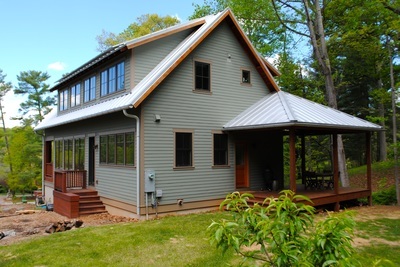 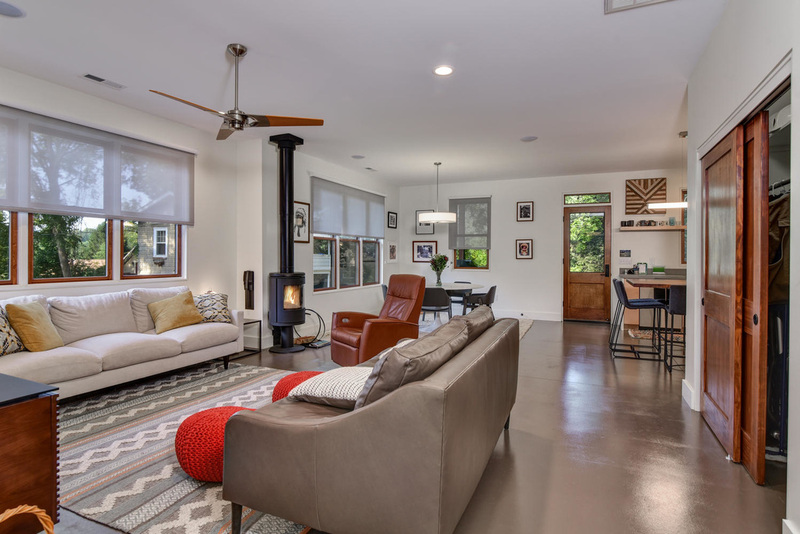 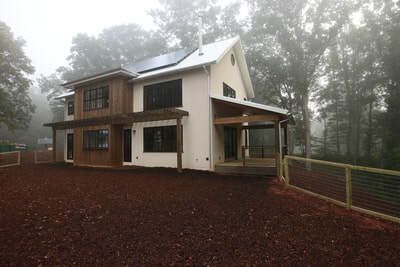 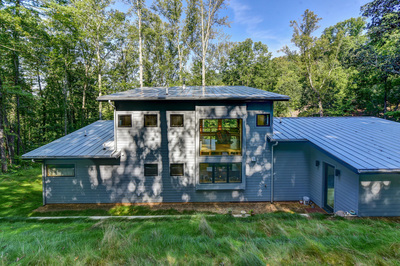 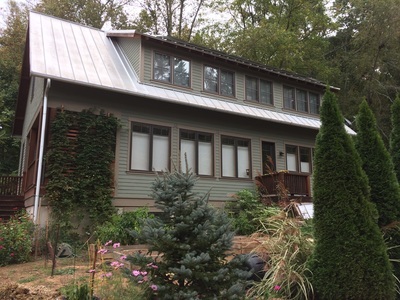 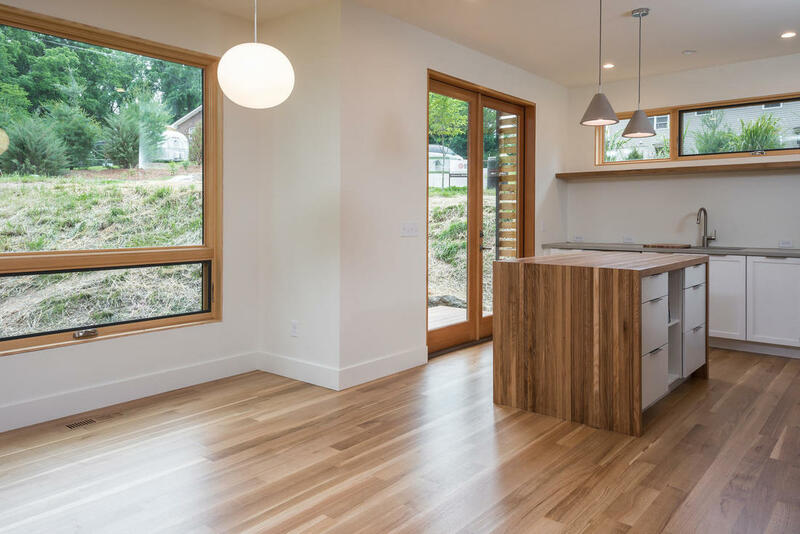 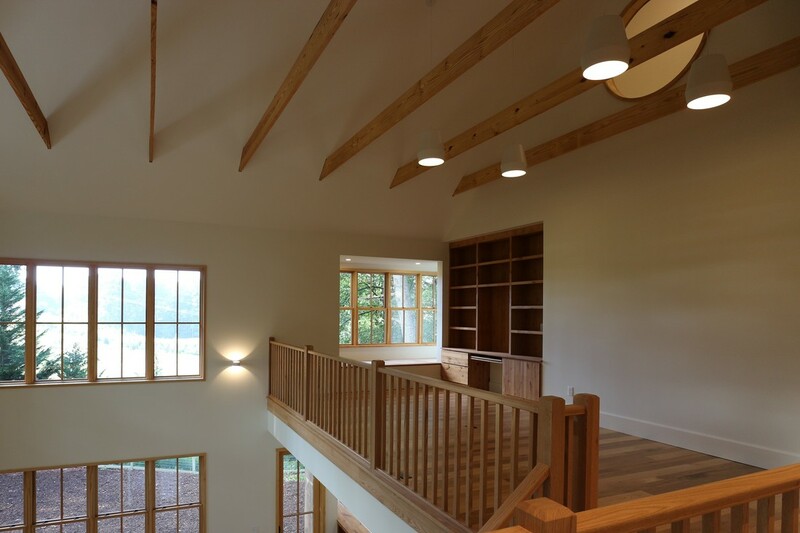 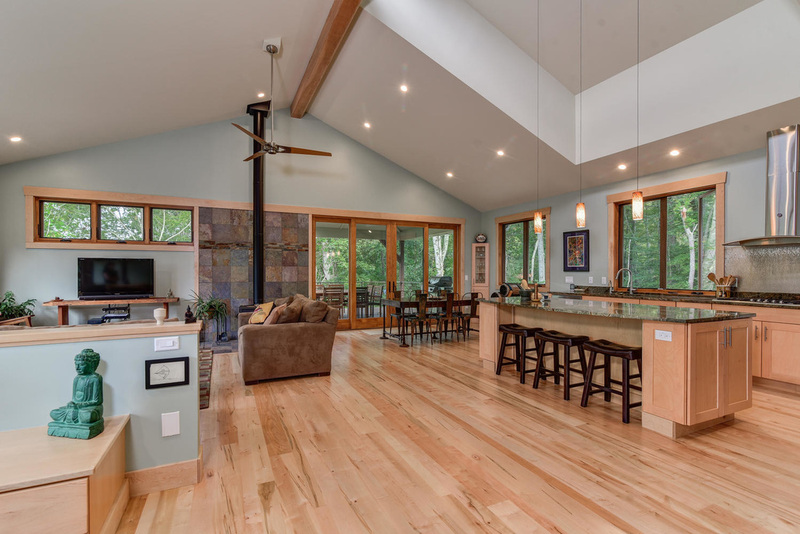 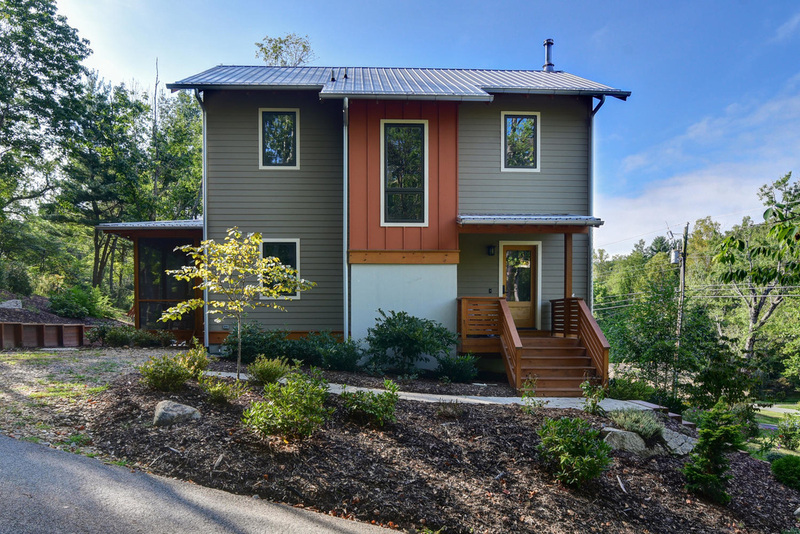 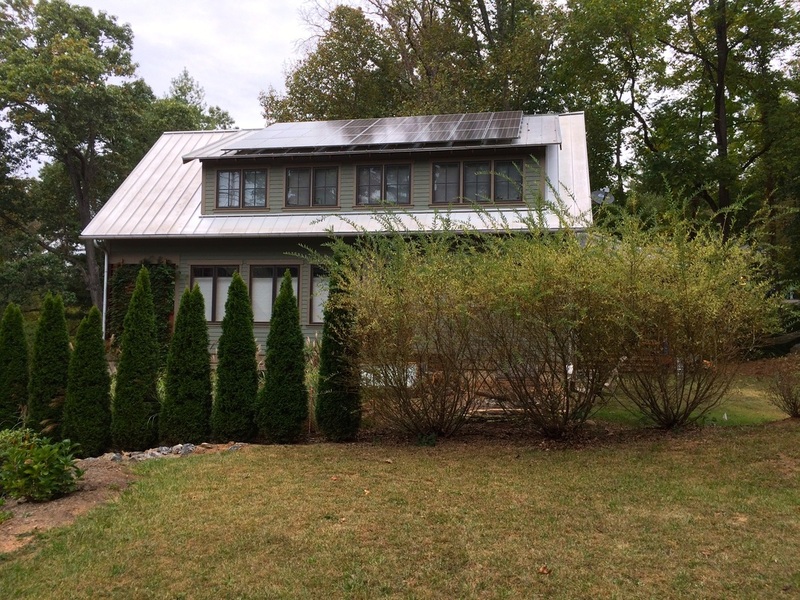 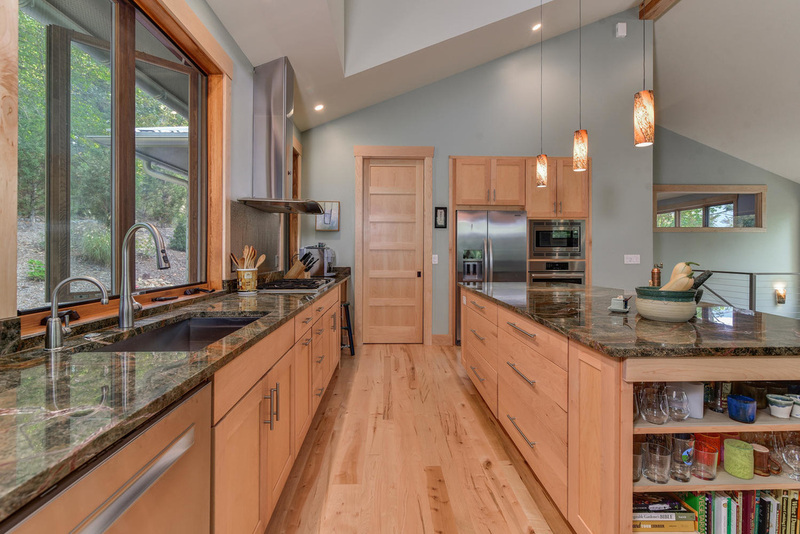 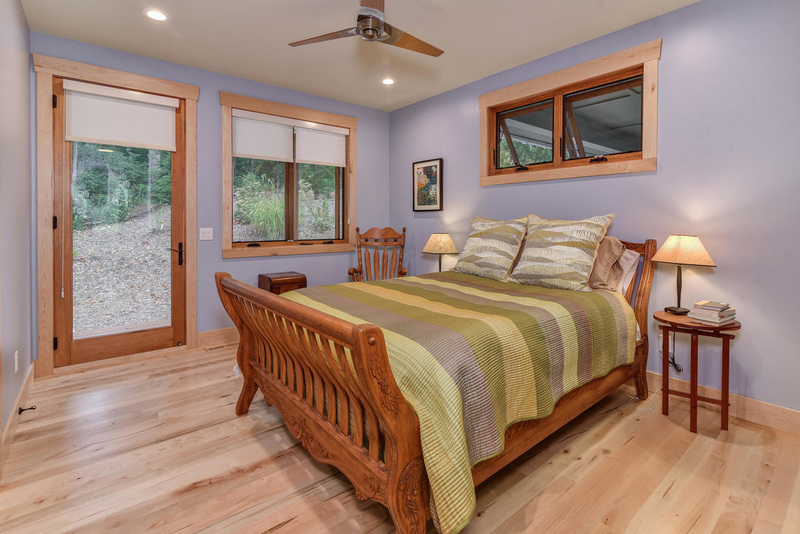 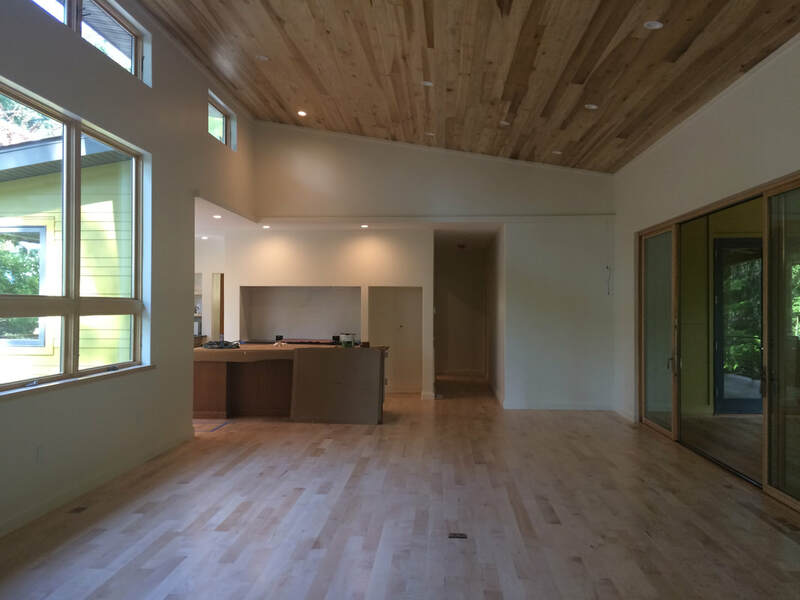 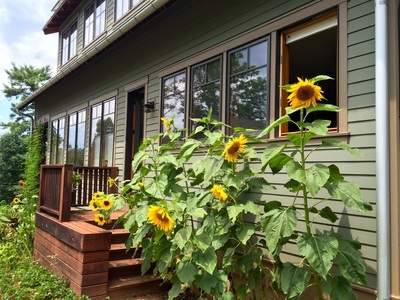 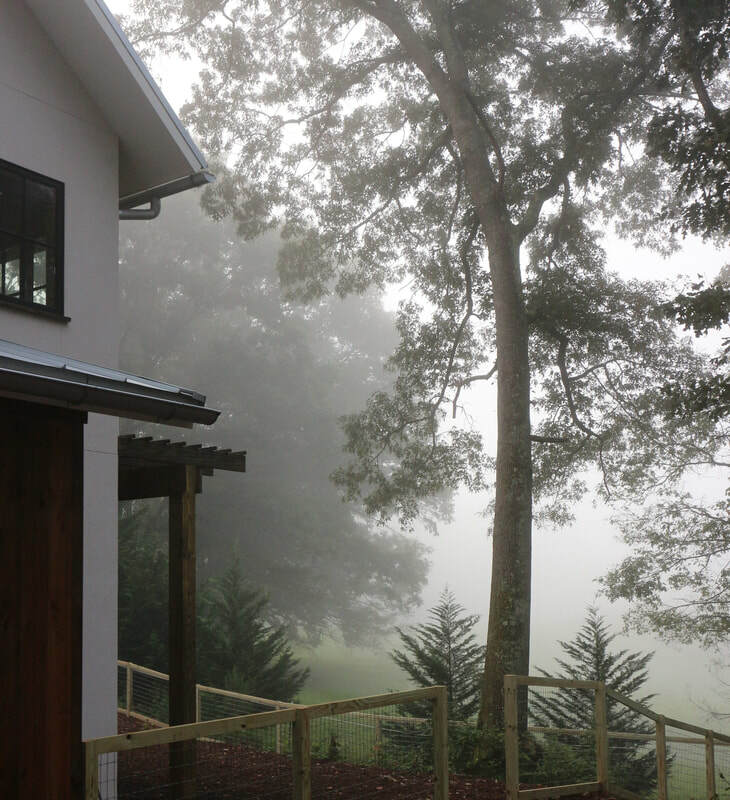 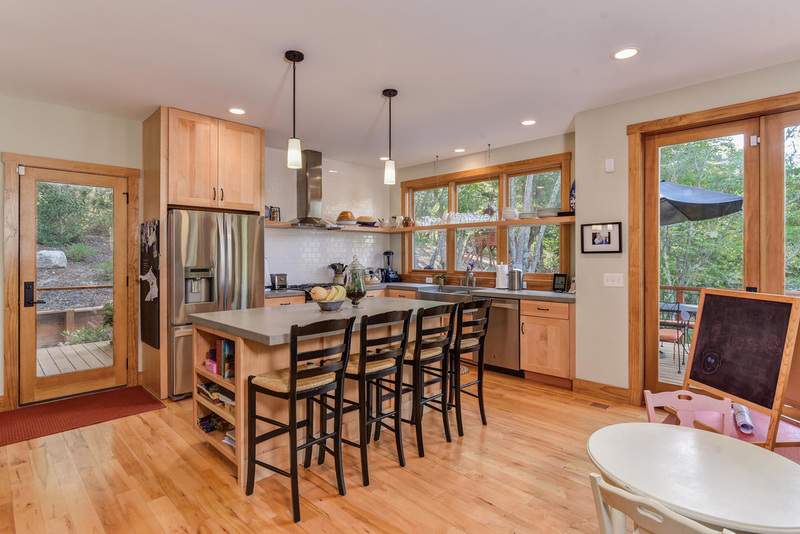 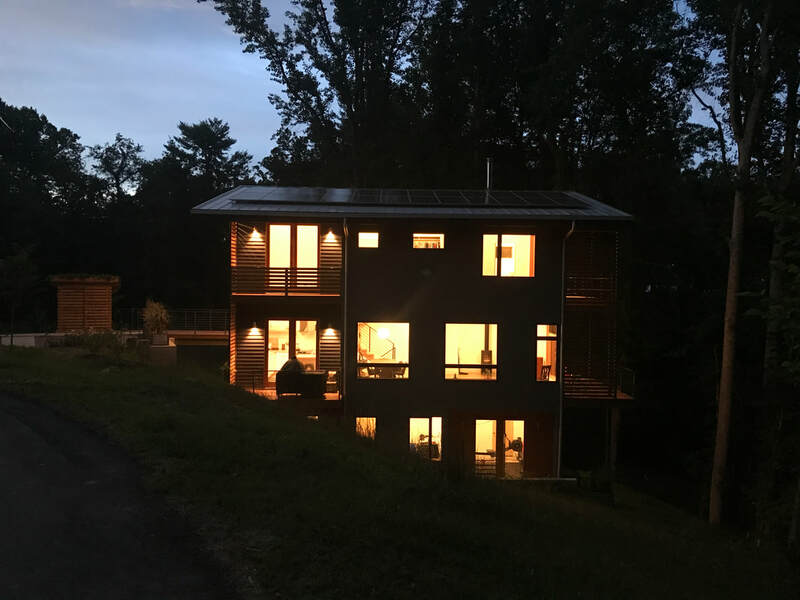 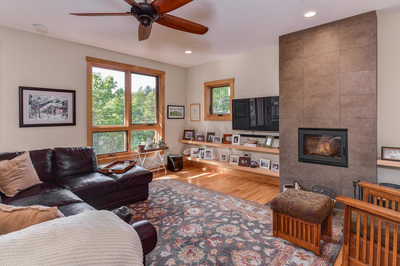 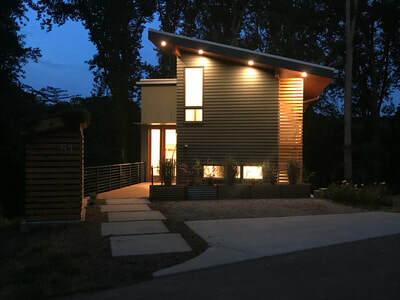 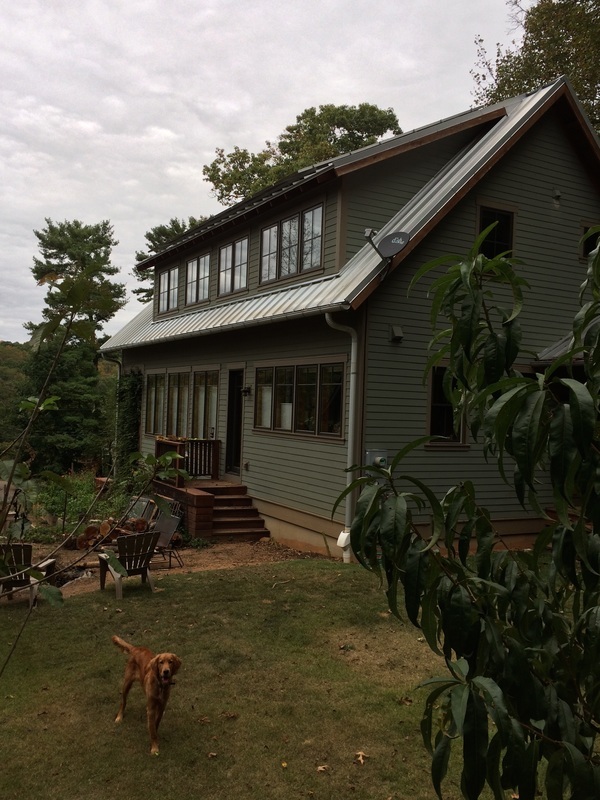 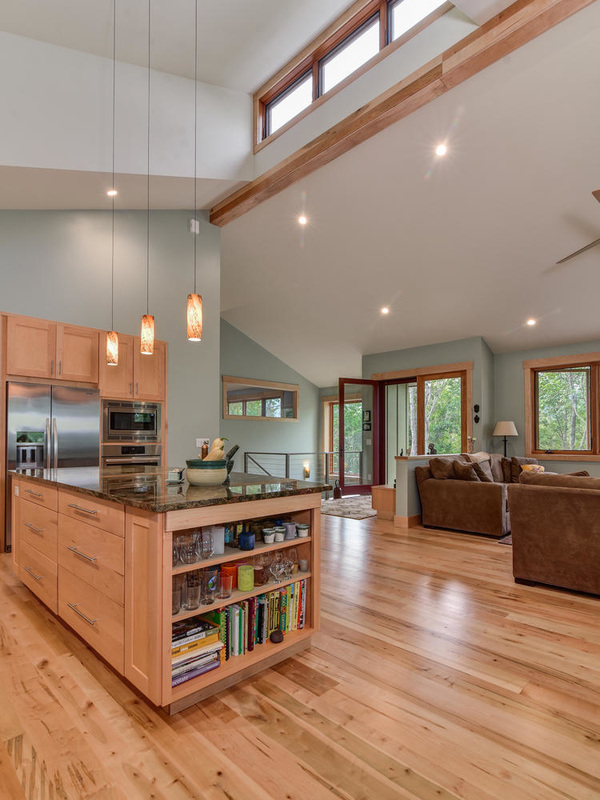 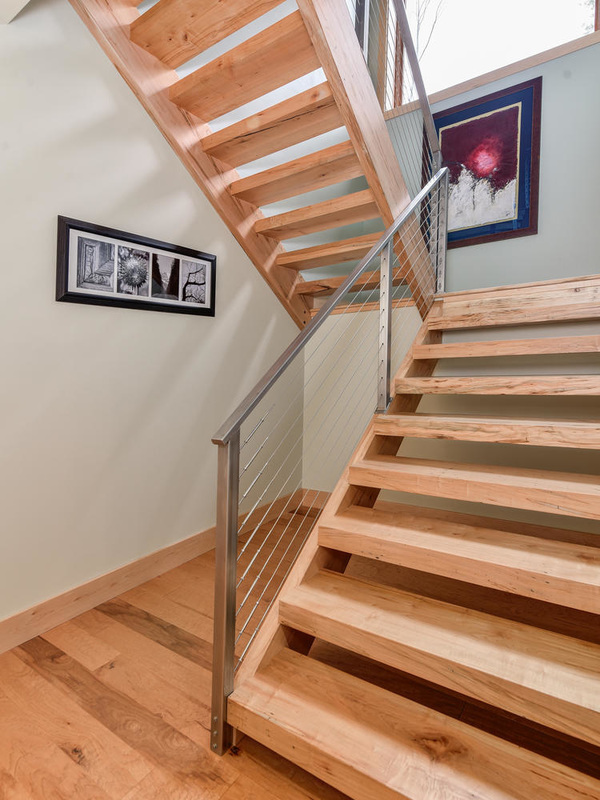 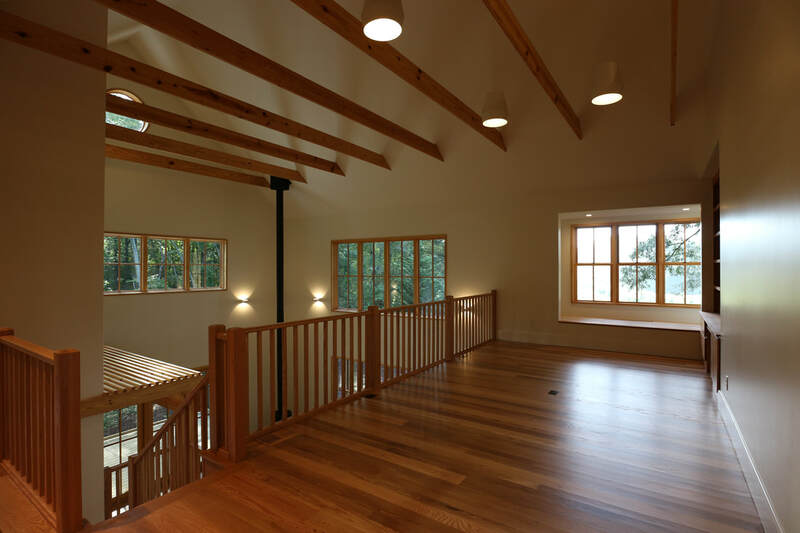 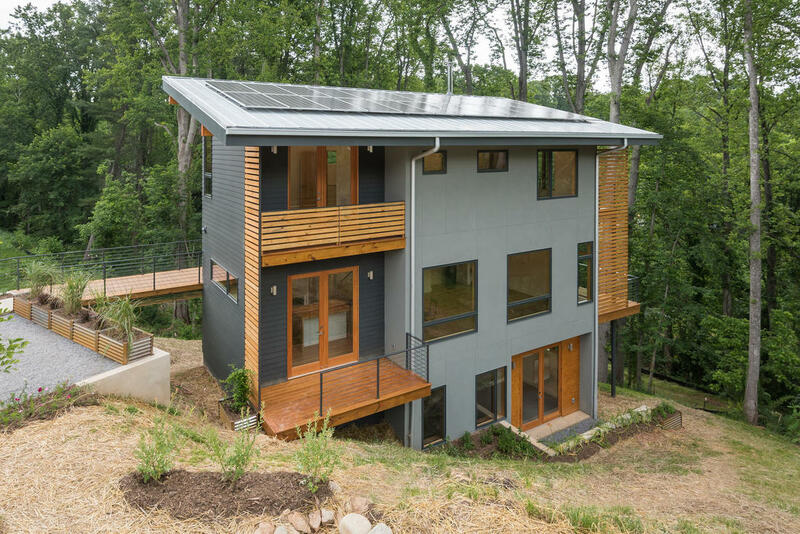 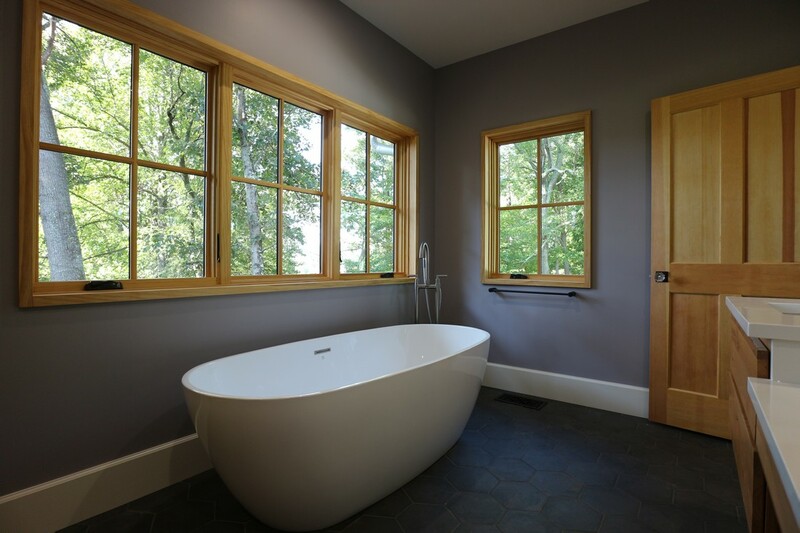 Winner of the 2015 AHBA Parade of Homes Green Home Award and Gold Craftsmanship Award, this spec home in West Asheville is Energy Star, EPA Indoor AirPlus and NCGreenBuilt Platinum certified. 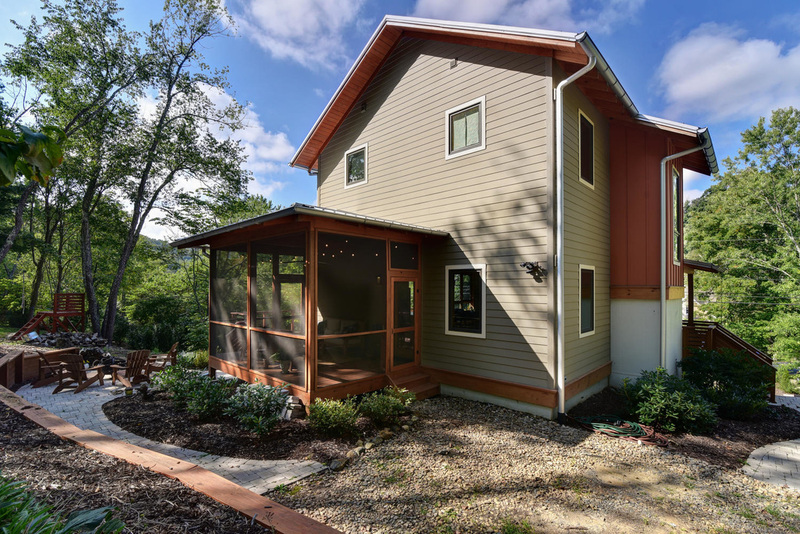 Designed with a young family in mind, the property flows easily from the front garden area through the open living/dining/kitchen area, onto the covered back porch and out into the fenced in back yard. 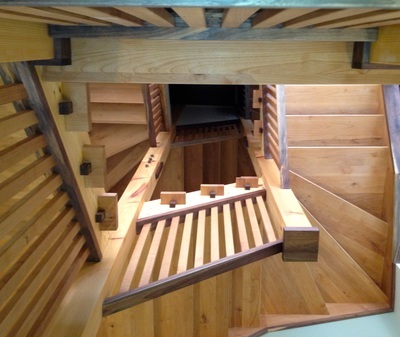 The large pantry, walk in master closet and fully decked attic with drop down stairs provide plenty of storage. 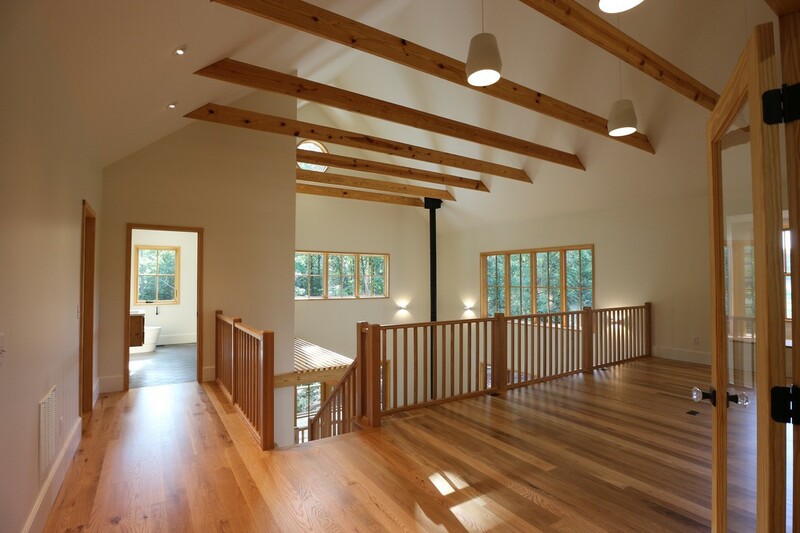 Ample South facing windows take full advantage of the winter sun for passive heating and keep the house bright inside all year round. The roof mounted photovoltaic array generates as much electricity as the home is predicted to use. 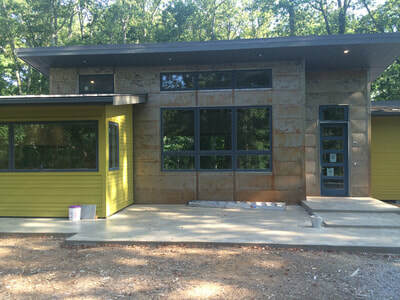 This custom design/build project was completed in June 2015. 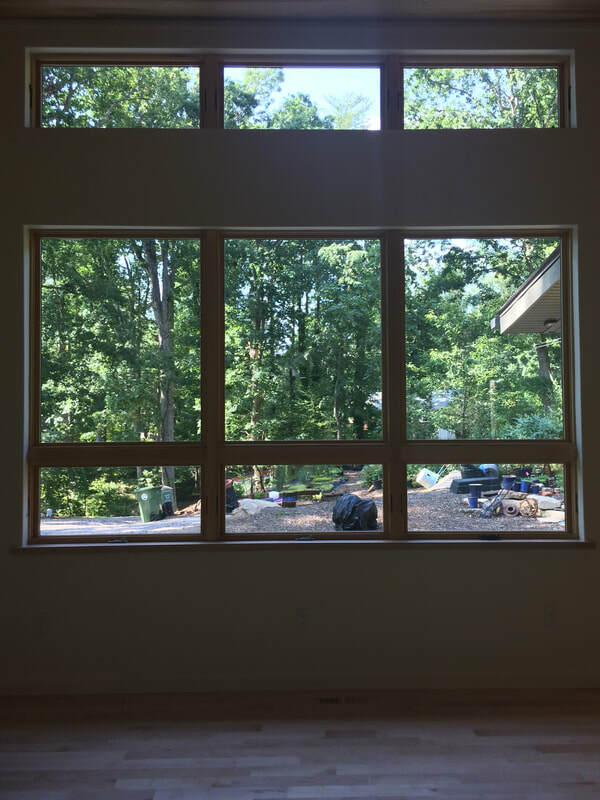 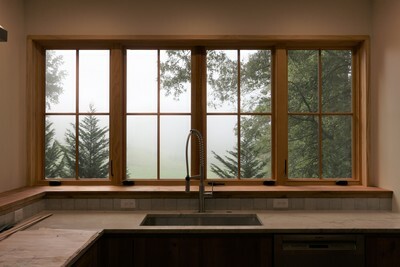 Blurring the lines between inside and out was a central theme of the design, using large South facing windows for winter heat gain and abundant natural light. 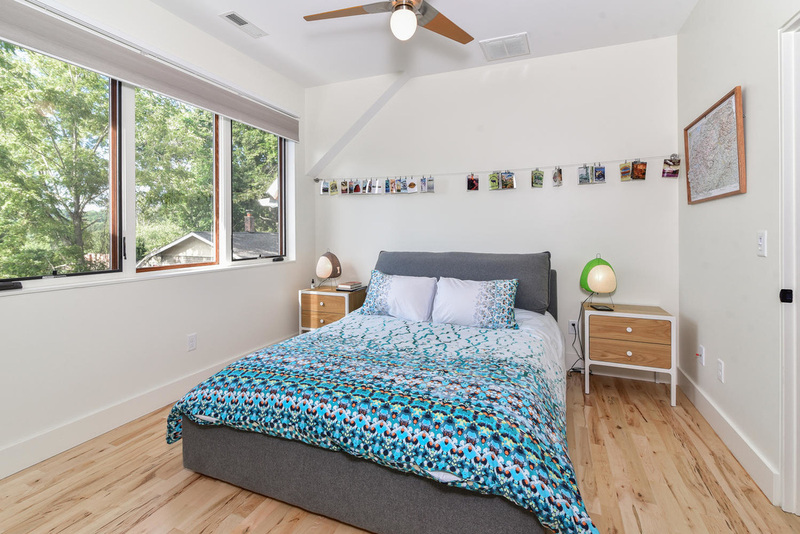 Incorporating geothermal HVAC, photovoltaic panels, high quality durable finishes and Energy Star certification means that this house will be low maintenance and have minimal utility bills. 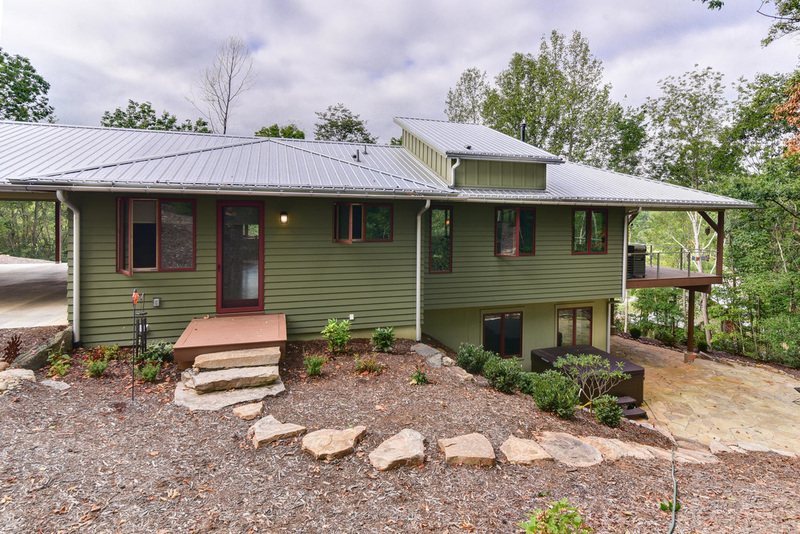 Designed for an active couple to downsize and age-in-place this 2400 sf North Asheville home features main level master suite, office, mud room, kitchen/dining/living area, large covered porch and carport with detached workshop. 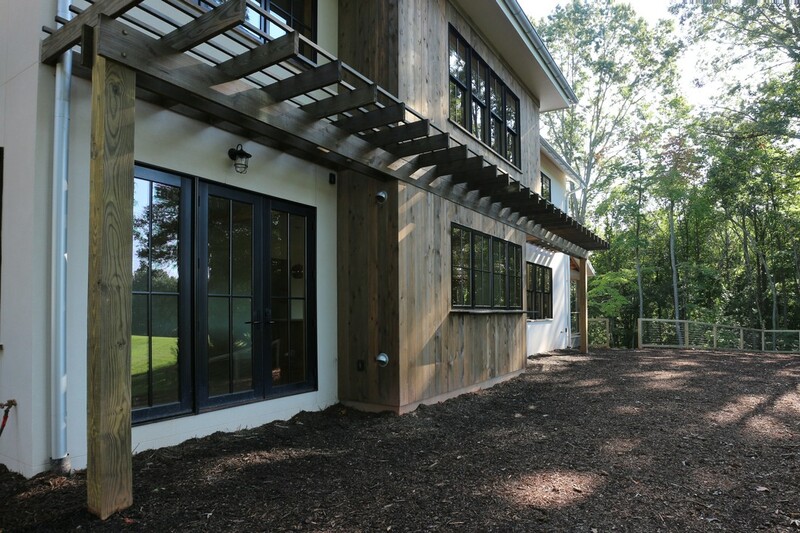 The walkout basement features a game room, guest suite, storage and a covered patio. 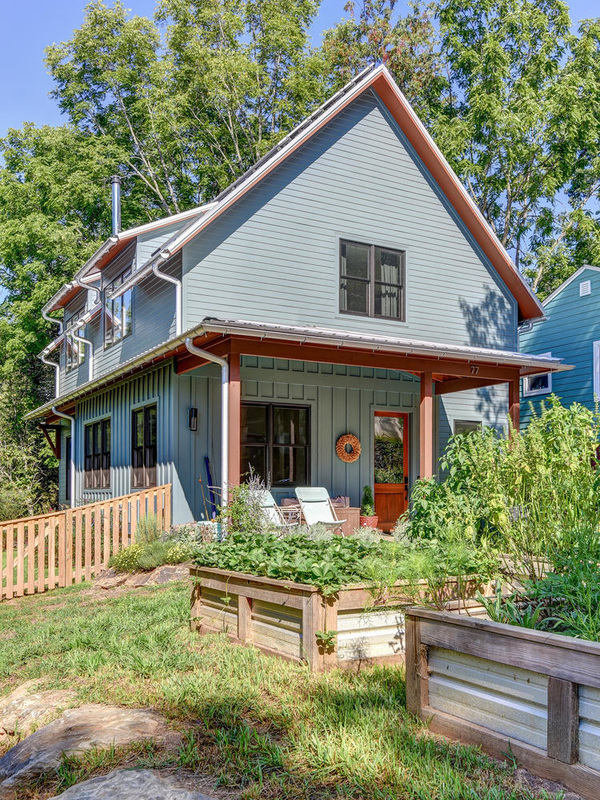 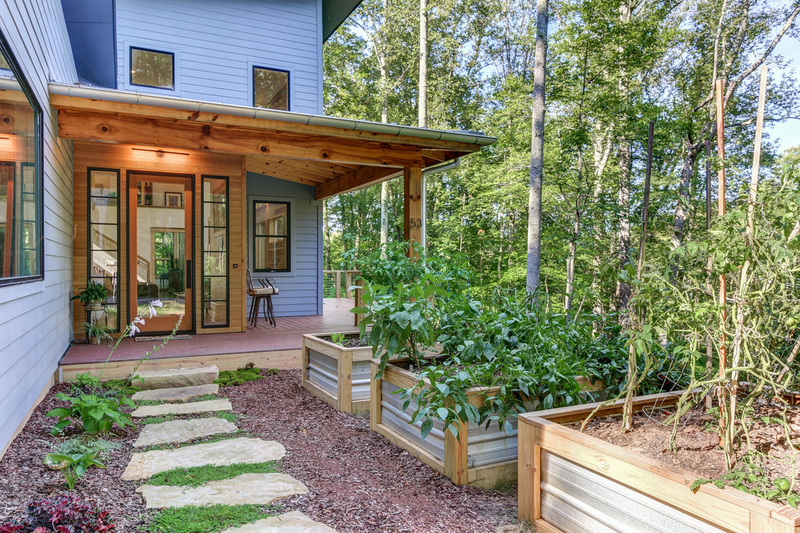 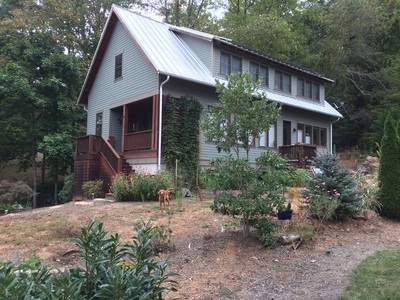 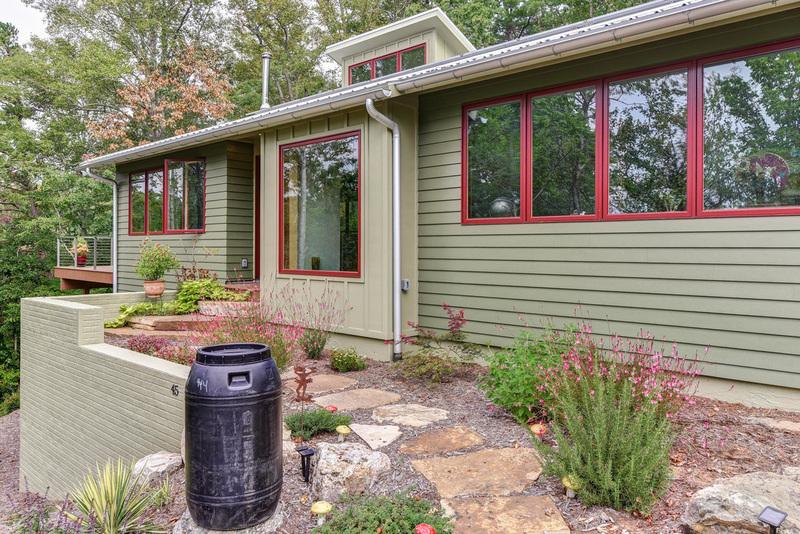 This spec home in North Asheville won the AHBA Parade of Homes Green Award in October 2013. 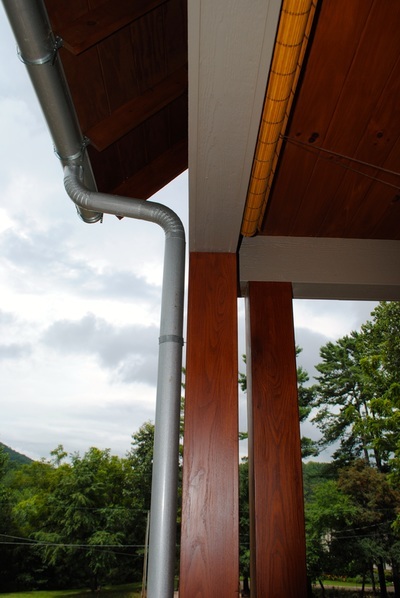 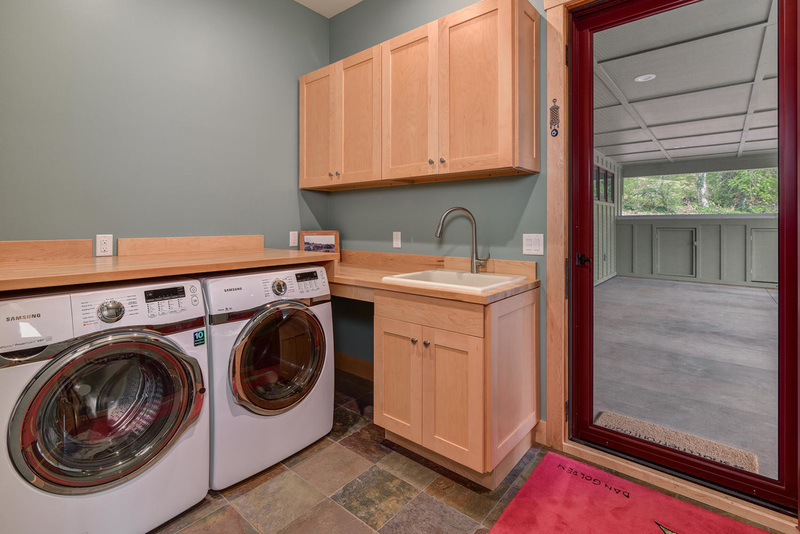 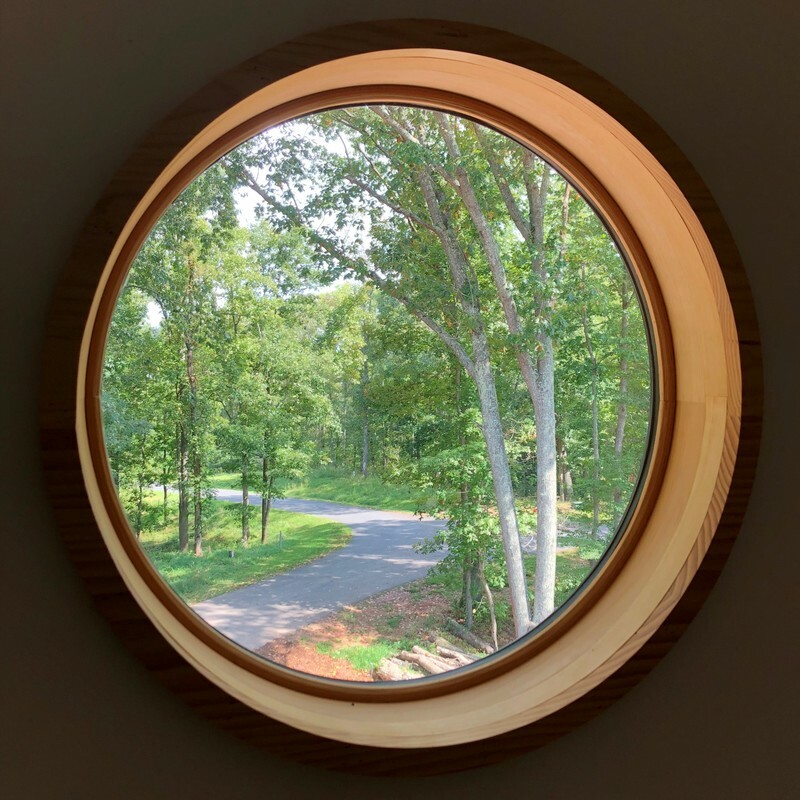 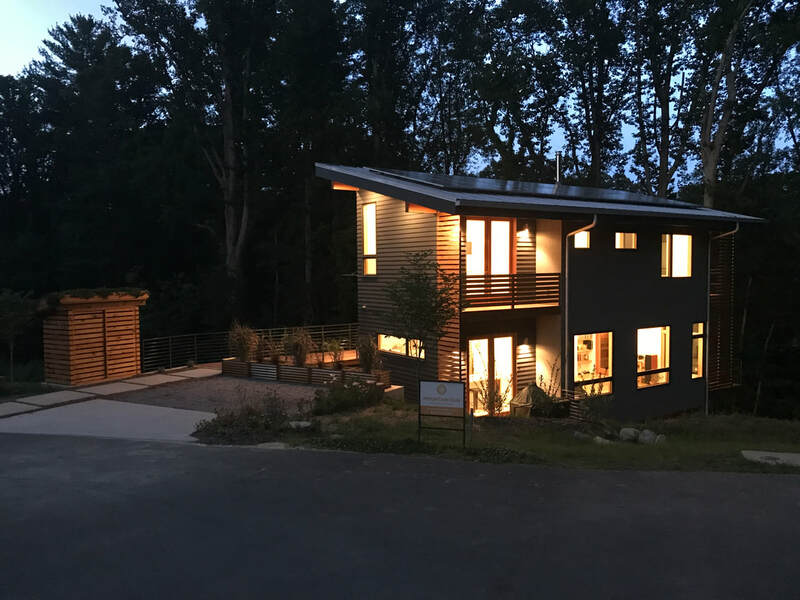 Designed and built by Mountain Sun Building & Design, it received Energy Star certification, NC GreenBuilt Gold certification and is Net Zero ready. This home was designed and built by Mountain Sun Building & Design. The home is Energy Star, Indoor Air Plus, Healthy Built Home Platinum and LEED for Homes Platinum certified. 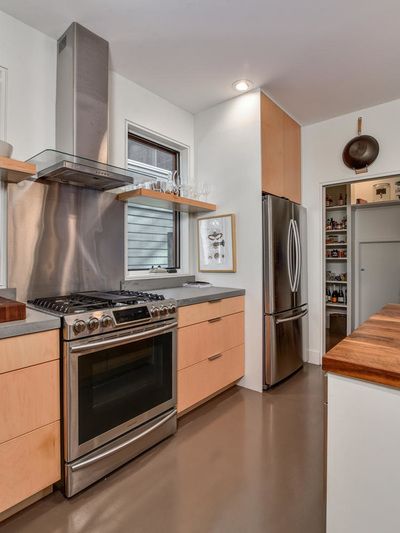 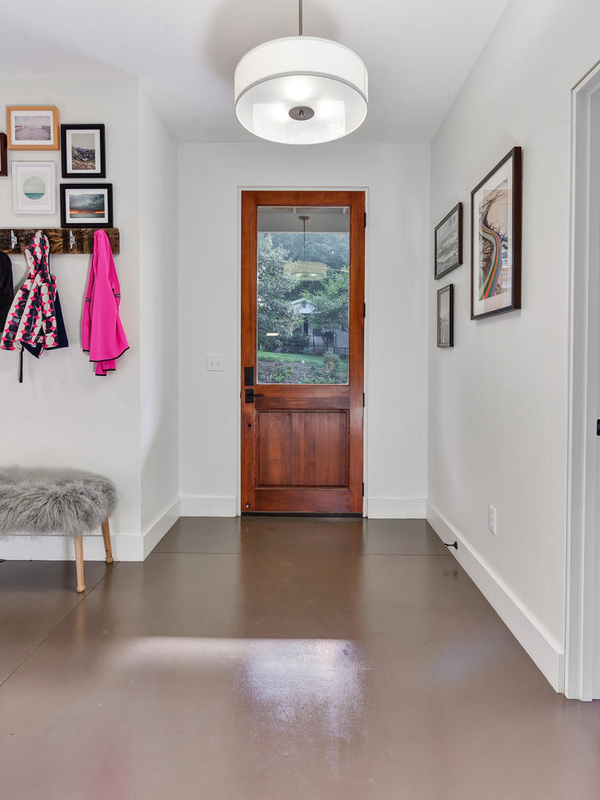 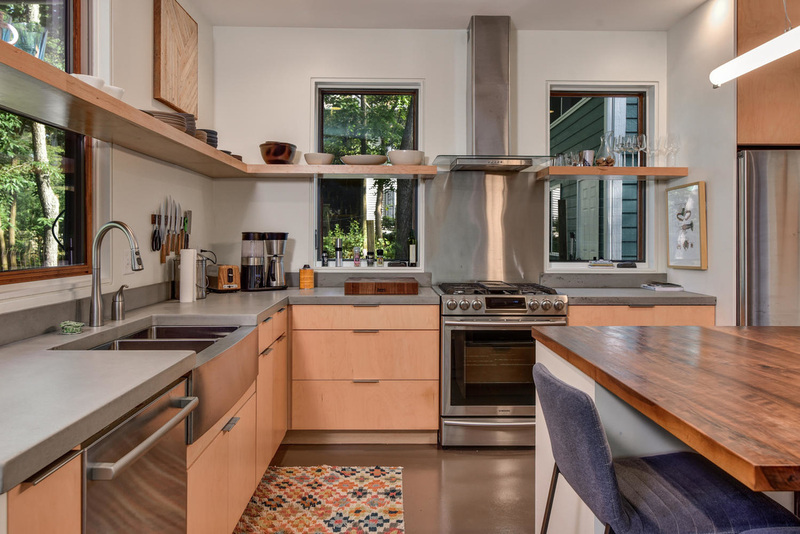 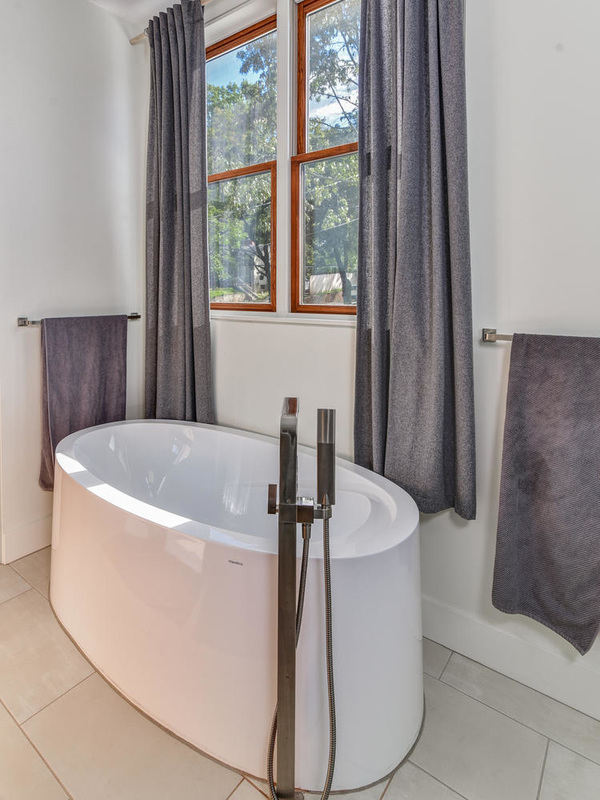 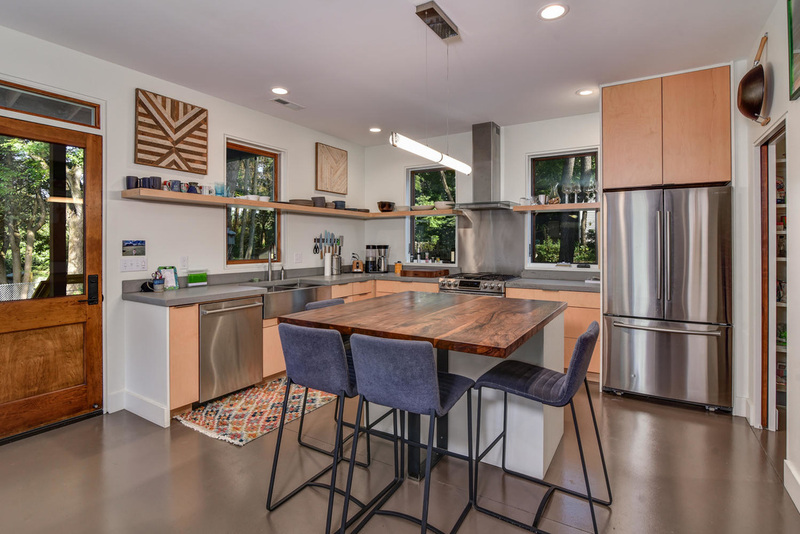 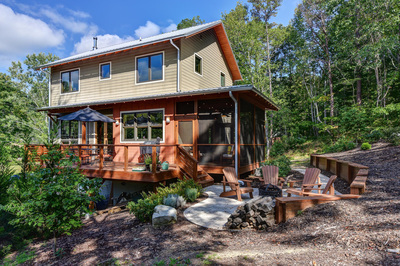 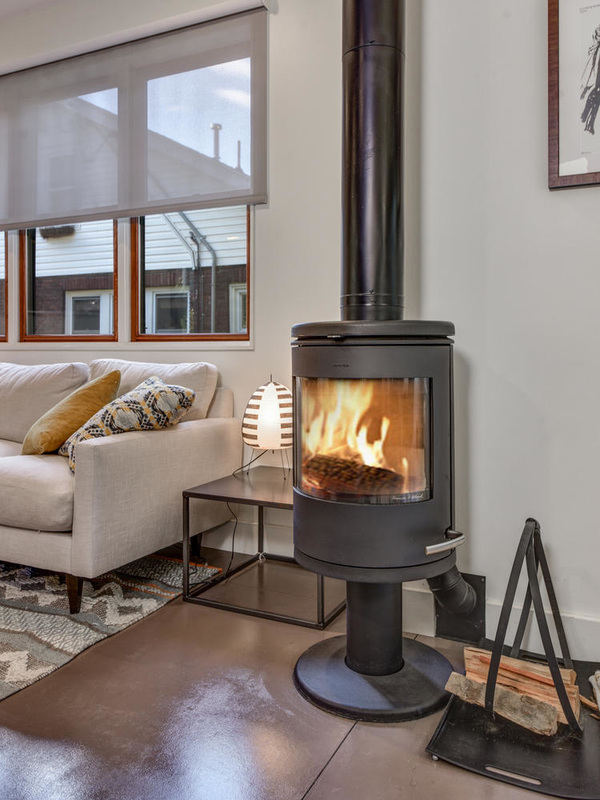 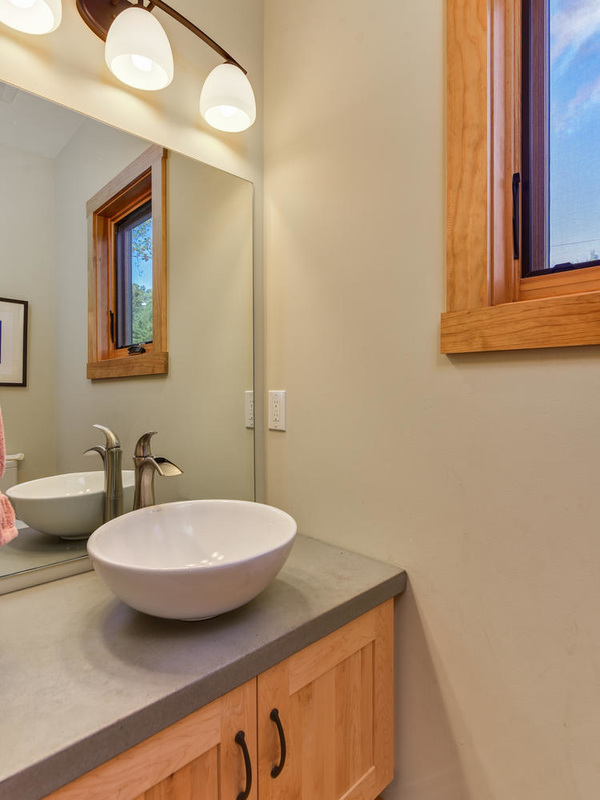 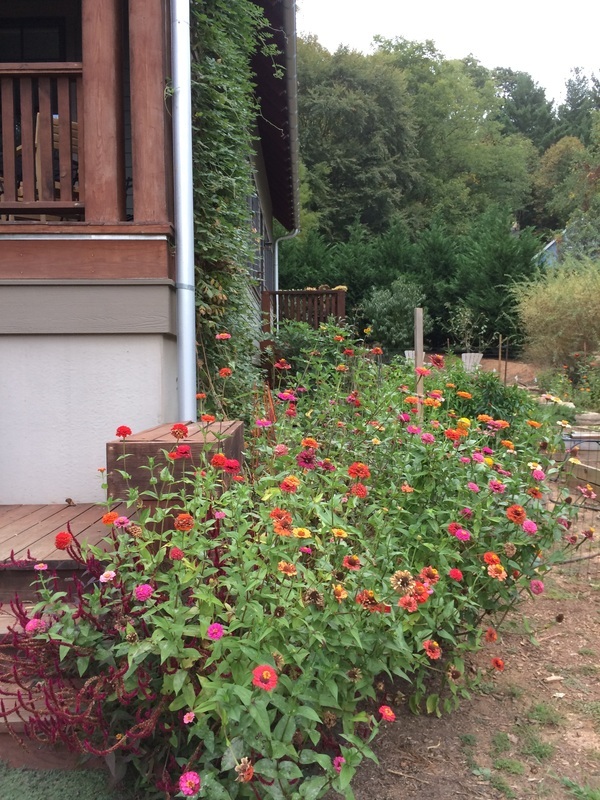 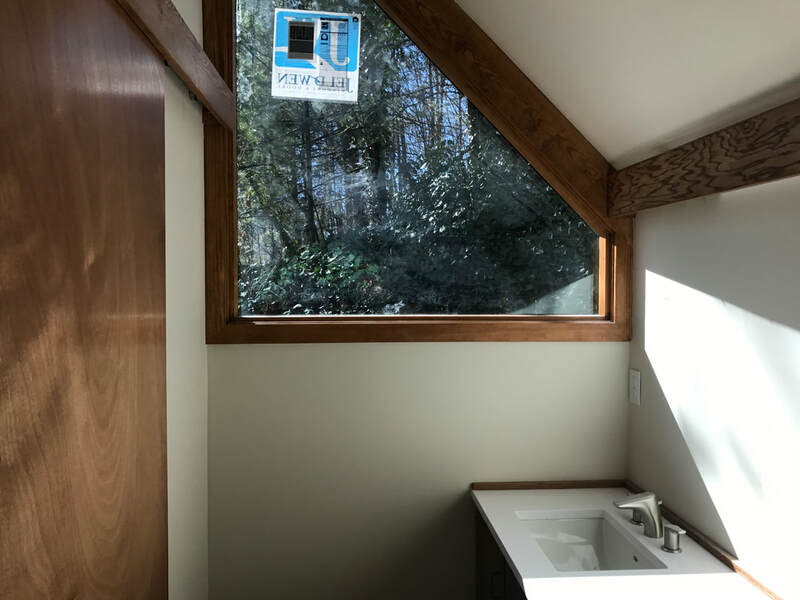 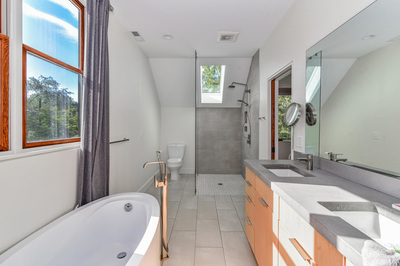 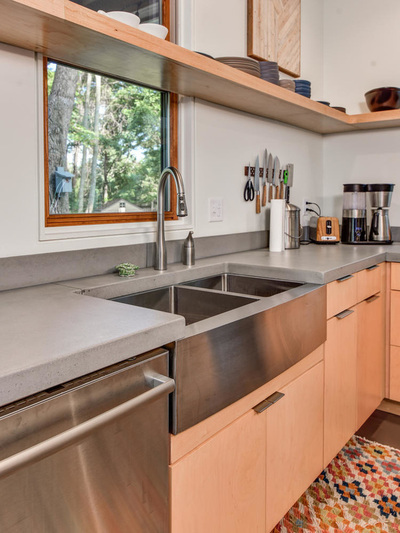 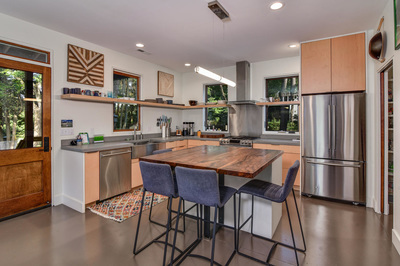 The home has geothermal heating and cooling, active and passive solar technologies, rainwater cistern for hose bibs and toilet flushing, a permaculture based landscape/site design, concrete floors and counters and many other "green" features. 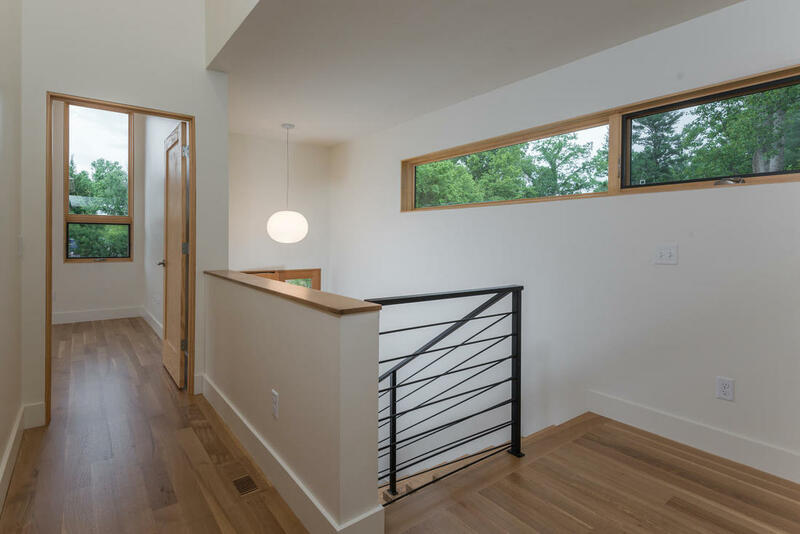 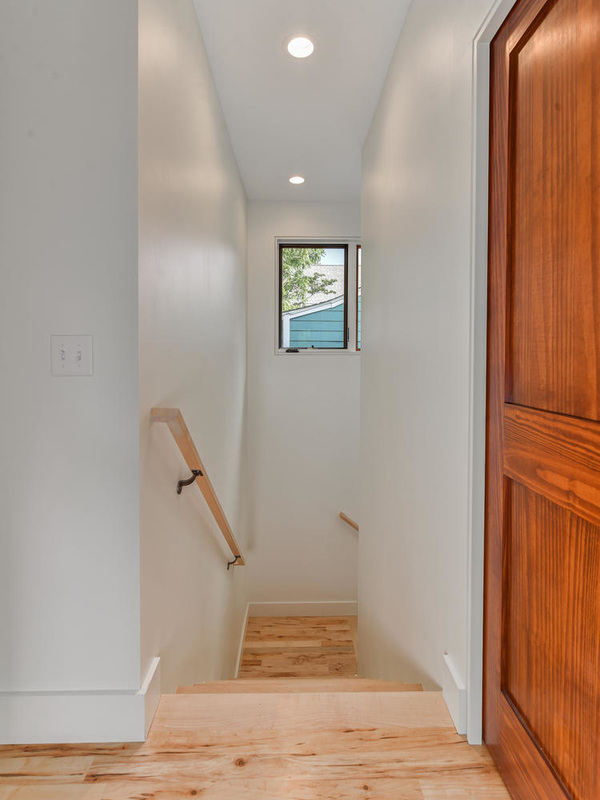 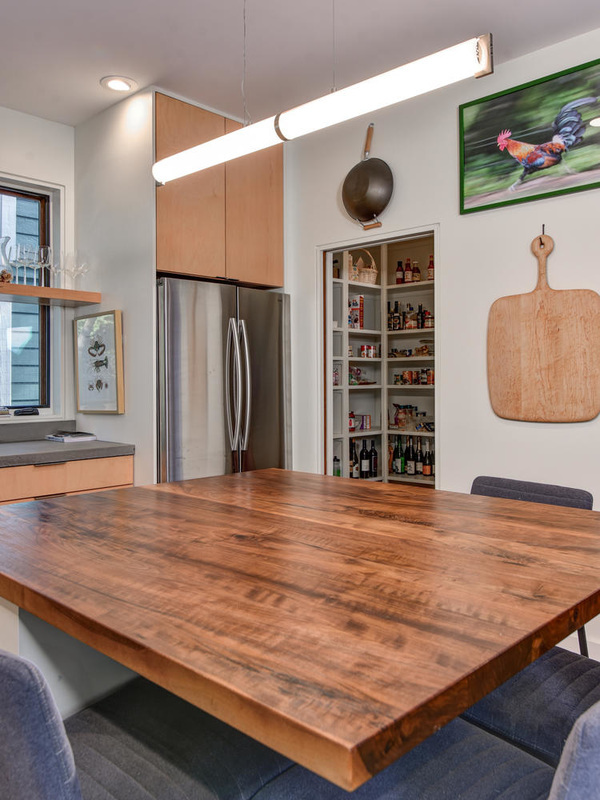 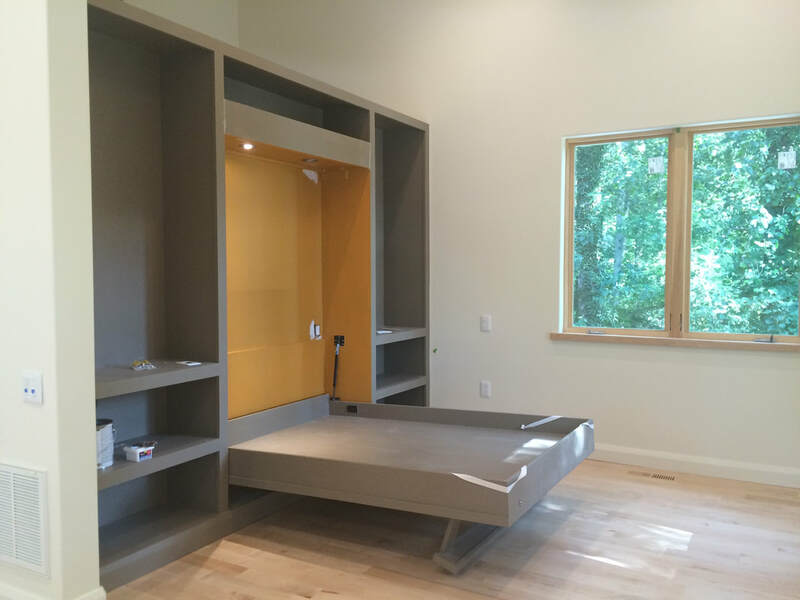 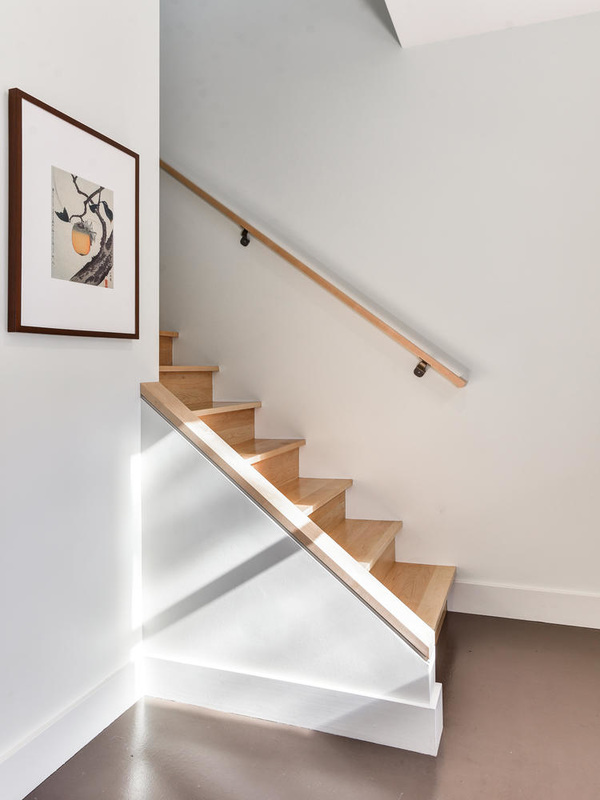 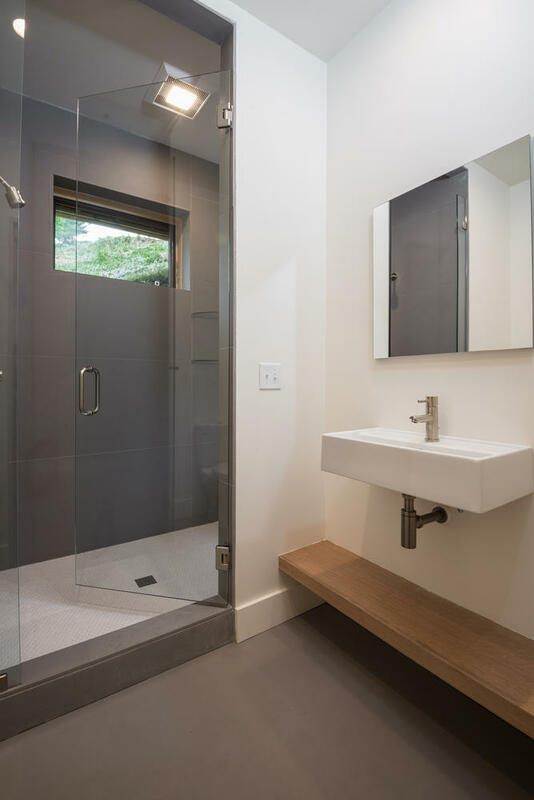 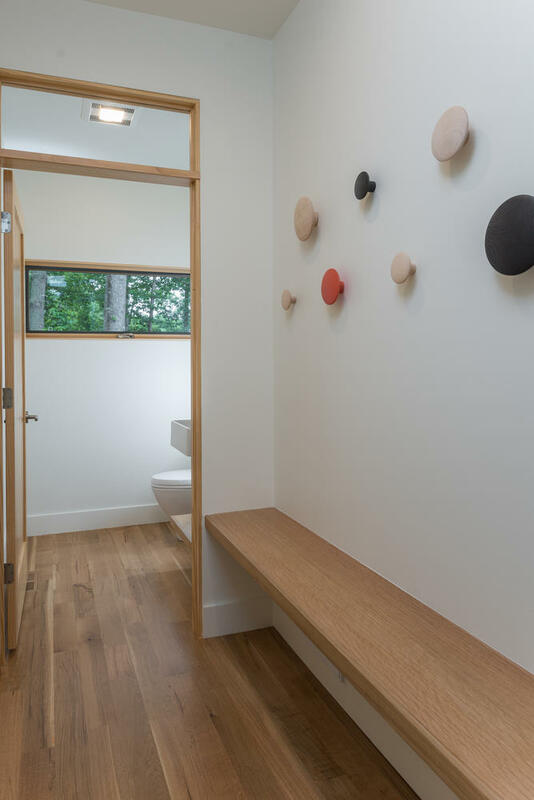 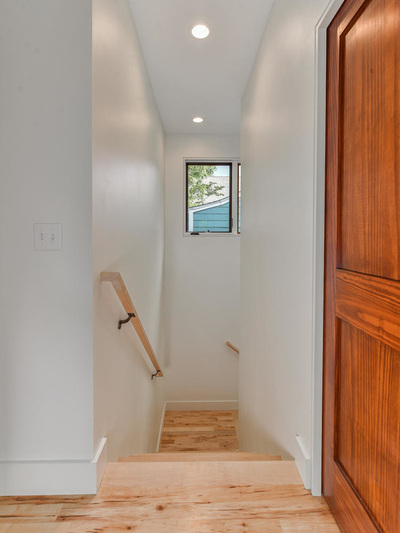 This high performance home was completed on a small budget by careful attention to cost/benefit analysis and use of simple, but high quality finishes. Click on the images below for larger pictures and a slideshow. 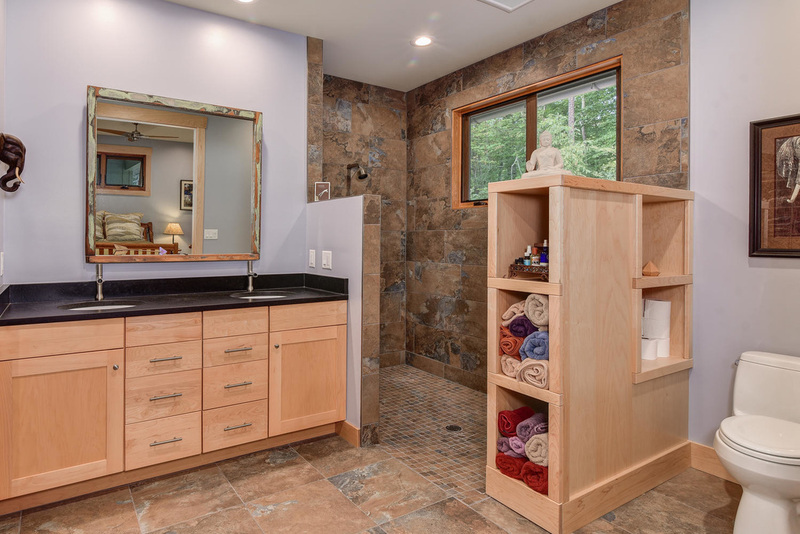 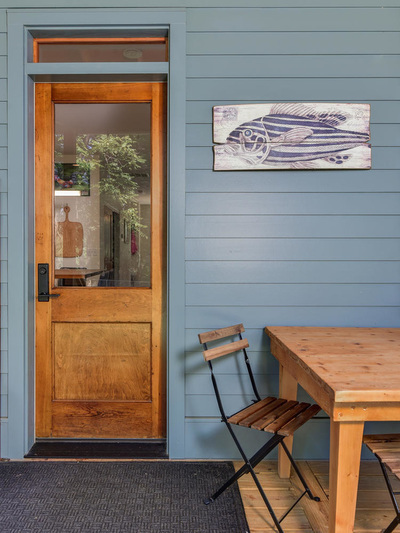 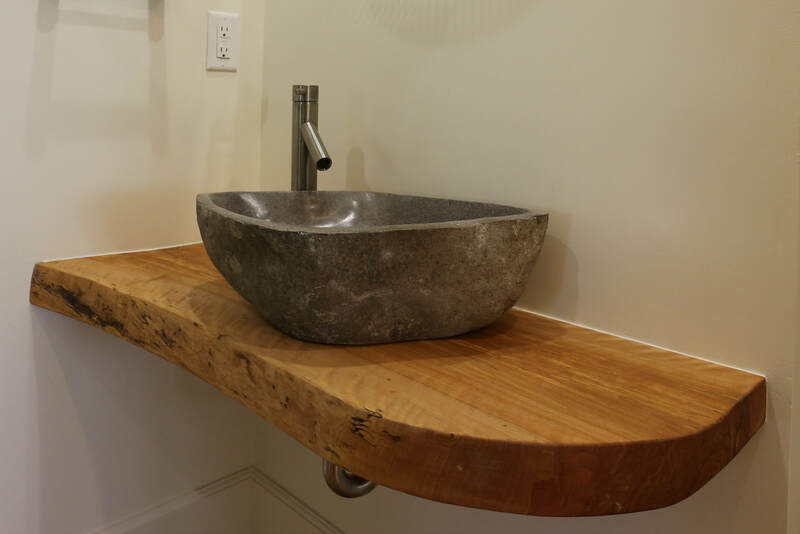 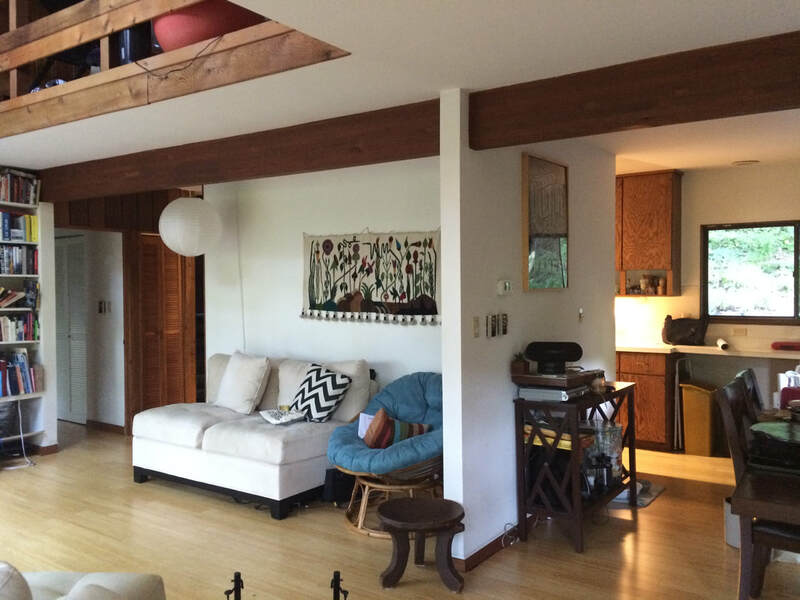 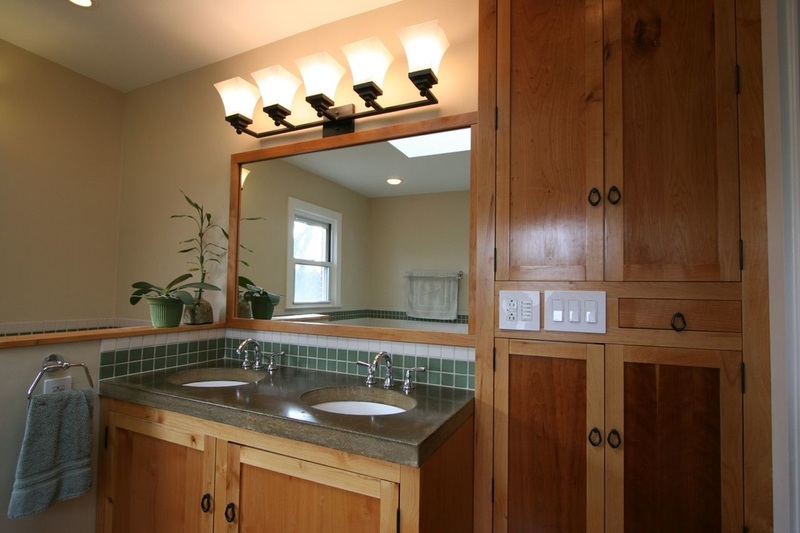 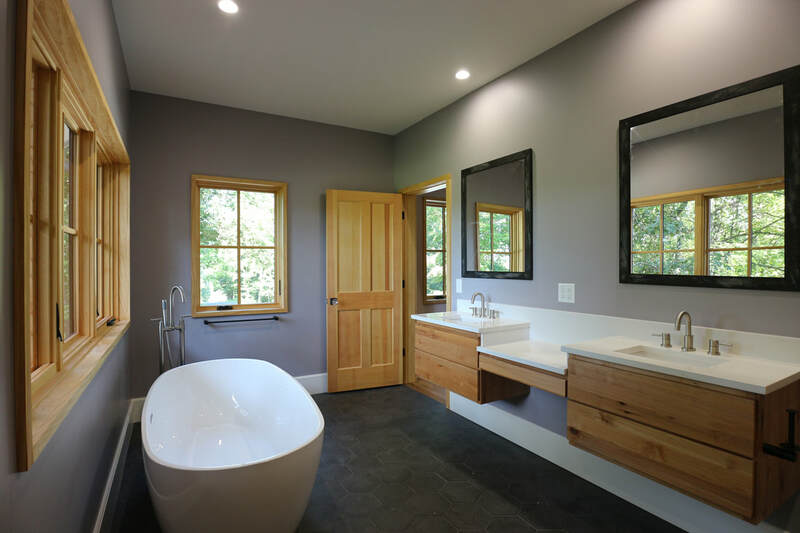 We completed extensive renovations in the living areas and bathroom of this 1952 ranch in West Asheville. Taking out walls between the living room, dining room and kitchen and vaulting the ceilings in the kitchen and bathroom gave the home more natural light and created a better space for gathering with friends and family.